The purpose of this manual is to discuss various piping and control strategies commonly used with chilled water systems including variable flow pumping systems. 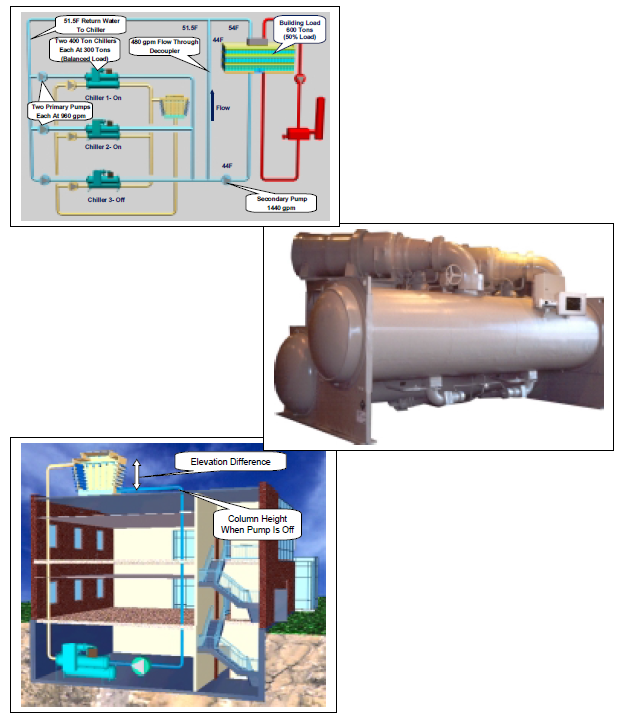 This Guide initially discusses the components used in a chilled water system. It then reviews various chiller plant designs explaining their operation, strengths and weaknesses. Where appropriate, sequence of operations are provided. Each project is unique so these sequences are just guidelines. In addition, many sections reference ASHRAE Standard 90.1-2001. The ASHRAE section numbers are provided in parentheses to direct the reader. The sections referenced in this Guide are by no means complete. It is recommended that the reader have access to a copy of Standard 90.1 as well as the Users Manual. 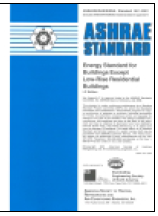 The Standard and manual can be purchased online at WWW.ASHRAE.org. 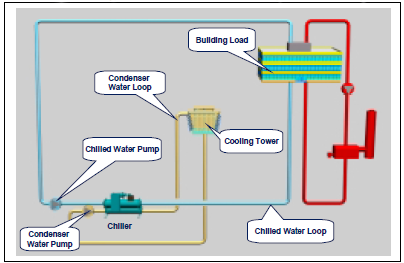 Figure 1 shows a basic chiller loop with a water-cooled chiller. The system consists of a chiller, cooling tower, building cooling load, chilled water and condensing water pumps and piping. This section will review each of the components. The chiller can be water-cooled, air-cooled or evaporatively cooled. The compressor types typically are reciprocating, scroll, screw or centrifugal. The evaporator can be remote from the condensing section on air-cooled units. This has the advantage of allowing the chilled water loop to remain inside the building envelope when using an outdoor chiller. In applications where freezing conditions can be expected, keeping the chilled water loop inside the building avoids the need for some form of antifreeze. There can be multiple chillers in a chilled water plant. The details of various multiple chiller plant designs will be discussed in future sections. The chilled water flows through the evaporator of the chiller. The evaporator is a heat exchanger where the chilled water gives up its sensible heat (the water temperature drops) and transfers the heat to the refrigerant as latent energy (the refrigerant evaporates or boils). Using this equation and the above design conditions, the temperature change in the evaporator is found to be 10oF. The water temperature entering the evaporator is then 54oF. Most air conditioning design conditions are based on 75oF and 50% relative humidity (RH) in the occupied space. The dewpoint for air at this condition is 55.08oF. Most HVAC designs are based on cooling the air to this dewpoint to maintain the proper RH in the space. Using a 10oF approach at the cooling coil means the supply chilled water needs to be around 44oF or 45oF. The designer is not tied to these typical design conditions. In fact, more energy efficient solutions can be found by modifying the design conditions, as the project requires. Changing the chilled water flow rate affects a specific chiller's performance. 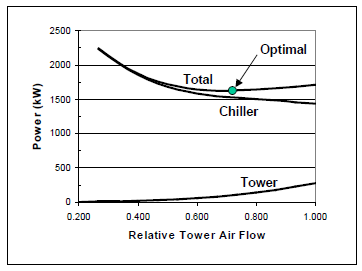 Too low a flow rate lowers the chiller efficiency and ultimately leads to laminar flow. The minimum flow rate is typically around 3 fps (feet per second). Too high a flow rate leads to vibration, noise and tube erosion. The maximum flow rate is typically around 12 fps. The chilled water flow rate should be maintained between these limits of 3 to 12 fps. The condenser water flows through the condenser of the chiller. The condenser is also a heat exchanger. In this case the heat absorbed from the building, plus the work of compression, leaves the refrigerant (condensing the refrigerant) and enters the condenser water (raising its temperature). The condenser has the same limitations to flow change as the evaporator. Chillers are often the single largest electricity users in a building. A 1000 ton chiller has a motor rated at 700 hp. Improving the chiller performance has immediate benefit to the building operating cost. Chiller full load efficiency ratings are usually given in the form of kW/ton, COP (Coefficient of Performance = kWcooling / kWinput) or EER (Energy Efficiency Ratio = Tons X 12/ kWinput). Full load performance is either the default ARI conditions or the designer specified conditions. It is important to be specific about operating conditions since chiller performance varies significantly at different operating conditions. Chiller part load performance can be given at designer-specified conditions or the NPLV (Non- Standard Part Load Value) can be used. The definition of NPLV is spelled out in ARI 550/590-98, Test Standard for Chillers. For further information refer to McQuay Application Guide AG 31-002, Centrifugal Chiller Fundamentals. Since buildings rarely operate at design load conditions (typically less than 2% of the time) chiller part load performance is critical to good overall chiller plant performance. Chiller full and part load efficiencies have improved significantly over the last 10 years (Chillers with NPLVs of 0.35 kW/ton are available) to the point where future chiller plant energy performance will have to come from chiller plant design. ASHRAE Standard 90.1-2001 includes mandatory requirements for minimum chiller performance. Table 6.2.1.C of this standard covers chillers at ARI standard conditions. Tables 6.2.1H to M cover centrifugal chillers at non-standard conditions. The piping is usually steel, copper or plastic. The chilled water piping is usually a closed loop. A closed loop is not open to the atmosphere. Figure 3 shows a simple closed loop with the pump at the bottom of the loop. Notice that the static pressure created by the change in elevation is equal on both sides of the pump. In a closed loop, the pump needs only to overcome the friction loss in the piping and components. The pump does not need to "lift" the water to the top of the loop. When open cooling towers are used in condenser piping, the loop is an open type. Condenser pump must overcome the friction of the system and "lift" the water from the sump to the top of the cooling tower. Figure 4 shows an open loop. 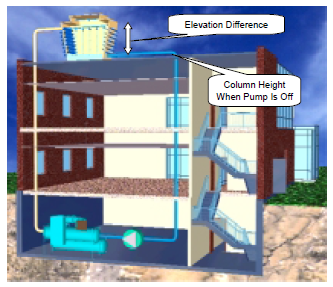 Notice the pump need only overcome the elevation difference of the cooling tower, not the entire building. carefully for buildings over 10 stories. In high-rise applications, the static pressure can become considerable and exceed the pressure rating of the piping and the components such as chillers. Although chillers can be built to higher pressure ratings (The standard is typically 150 PSI but the reader is advised to check with the manufacturer) high pressure systems can become expensive. The next standard rating is typically 300 PSI. Above that, the chillers become very expensive. One solution is to use heat exchangers to isolate the chillers from the static pressure. While this solves the pressure rating for the chiller, it introduces another device and another approach that affects supply water temperature and chiller performance. A second solution is to locate chiller plants on various floors throughout the building selected to avoid exceeding the 150 PSI chiller rating. An expansion tank is required in the chilled water loop to allow for the thermal expansion of the water. Expansion tanks can be open type, closed type with air-water interface or diaphragm type. Tank location will influence the type. Open tanks must be located above the highest point in the system (for example, the penthouse). Airwater interface and diaphragm type tanks can be located anywhere in the system. Generally, the lower the pressure in the tank, the smaller the tank needs to be. Tank size can be minimized by locating it higher in the system. The pressure at which the tank is operated is the reference point for the entire hydronic system. 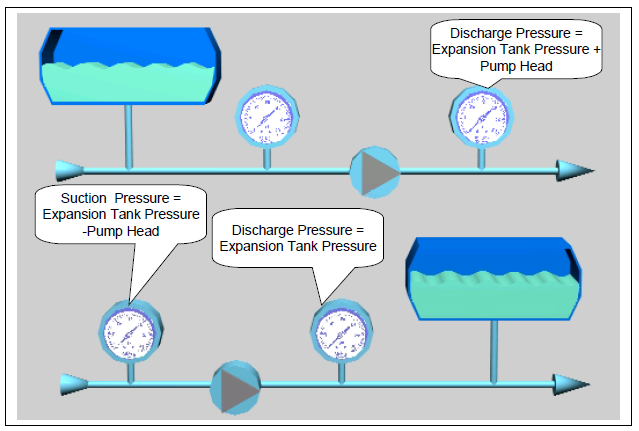 The location of the tank -which side on the pump (suction or discharge) - will affect the total pressure seen by the system. When the pump is off, the tank will be exposed to the static pressure plus the pressure due to thermal expansion. If the tank is located on the suction side, when the pump is running, the total pressure seen on the discharge side will be the pressure differential, created by the pump, added to the expansion tank pressure. If the expansion tank is located on the discharge side of the pump, the discharge pressure will be the same as the expansion tank pressure and the suction side pressure will be the expansion tank pressure minus the pump pressure differential. Chilled water piping is insulated since the water and hence the piping is often below the dewpoint temperature. Condensate would form on it and heat loss would occur. The goal of the insulation is to minimize heat loss and maintain the outer surface above the ambient air dewpoint. In most cases, the condenser water piping is an open loop. 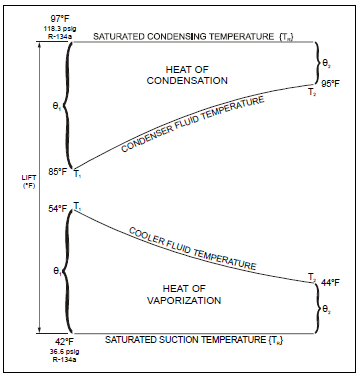 Figure 4 shows an open loop with the water open to the atmosphere. When the pump is not running, the level in the supply and return piping will be even at the level of the sump. When the pump operates, it needs to overcome the friction loss in the system and "lift" the water from the sump level to the top of the loop. Condenser water piping is typically not insulated since there will be negligible heat gain or loss and sweating will not occur. If the piping is exposed to cold ambient conditions, however, it could need to be insulated and heat traced to avoid freezing. Figure 6 shows reverse return piping. Reverse return piping is designed such that the path through any load is the same length and therefore has approximately the same fluid pressure drop. Reverse return piping is inherently self-balancing. It also requires more piping and consequently is more expensive. Direct return piping results in the load closest to the chiller plant having the shortest path and therefore the lowest fluid pressure drop. Depending on the piping design, the difference in pressure drops between a load near the chiller plant and a load at the end of the piping run can be substantial. Balancing valves will be required. The advantage of direct return piping is the cost savings of less piping. 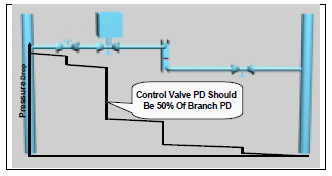 For proper control valve selection, it is necessary to know the pressure differential between the supply and return header (refer to Control Valve Basics, page 20). While at first it would appear with reverse return piping, that the pressure drop would be the same for all devices, this is not certain. Changes in pipe sizing in the main headers, different lengths and fittings all lead to different pressure differentials for each device. When the device pressure drop is large relative to piping pressure losses, the difference is minimized. In direct return piping, the pressure drops for each device vary at design conditions depending on where they are in the system. The valve closest to the pumps will see nearly the entire pump head. Valves at the furthest end of the loop will see the minimum required pressure differential. Assuming the pressure differential sensor is located at the furthest end, all valves in a direct return system should be selected for the minimum pressure differential. This is because if any one device is the only one operating, the pressure differential controller will maintain the minimum differential across that device. The decision whether to use direct or reverse return piping should be based on system operability vs. first cost. Where direct return piping is used, flow-balancing valves should be carefully located so that the system can be balanced. □ Pipe material. Different materials have different friction factors. □ Pipe sizing. Smaller piping raises the pressure drop. This must be balanced against the capital cost and considered over the lifetime of the system. □ Fittings. Minimize fittings as much as possible. □ Valves. Valves represent large pressure drops and can be costly. Isolation and balancing valves should be strategically placed. □ Direct return vs. Reverse return. Piping insulation reduces heat gain into the chilled water. This has a compound effect. First, any cooling effect that is lost due to heat gain is additional load on the chiller plant. Second, in most cases, to account for the resultant temperature rise, the chilled water setpoint must be lowered to provide the correct supply water temperature at the load. This increases the lift on the chillers and lowers their performance. □ Systems operating between 60oF and 105oF. □ Pumps with motors less than 10 hp. □ When throttling results in no greater than 5% of nameplate horsepower or 3 hp, whichever is less. □ Controls limit changeovers based on 15oF ambient drybulb deadband. □ System will operate in one mode for at least 4 hours. □ Reset controls lower the changeover point to 30oF or less. Typically centrifugal type pumps are used for both condenser water and chilled water systems. They can be either inline or base mounted. The pumps must be sized to maintain the system dynamic head and the required flow rate. Normally, the pumps are located so they discharge into the chiller heat exchangers. Centrifugal pumps are non-positive displacement type so the flow rate changes with the head. The actual operating point is where the system curve crosses the pump curve. In systems with control valves, the system curve changes every time a valve setting changes. This is important because the pump affinity laws cannot be used to estimate a change if the system curve is allowed to change. Identical pumps in parallel will double the flow at the same head. Identical pumps in series will double the head. Figure 10 shows a steep and flat curve profile. Different pumps provide different profiles each with their own advantages. 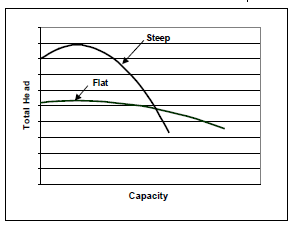 The steep curve is better suited for open systems such as cooling towers where high lift and stable flow are desirable. The flat profile is better suited for systems with control valves. The flat profile will maintain the necessary head over a wide flow range. 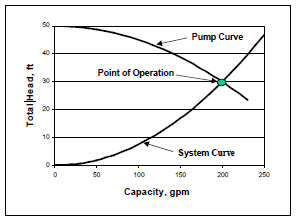 Figure 11 shows a typical pump curve. Since pumps are direct drive, the pump curves are typically for standard motor speeds (1200, 1800 or 3600 rpm). 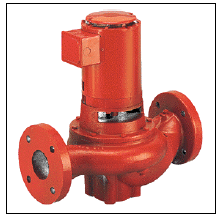 The required flowrate and head can be plotted and the subsequent efficiency and impeller diameter can be found. As the flow increases, generally the Net Positive Suction Head (NPSH) decreases. This is due to the increased fluid velocity at the inlet of the impeller. NPSH is required by the pump to avoid the fluid flashing to gas in the inlet of the impeller. This can lead to cavitation and pump damage. NPSH is an important consideration with condenser pumps particularly when the chillers are in the penthouse and the cooling towers are on the same level. To provide redundancy, multiple pumps are used. Common approaches are (1) a complete full-sized stand-by pump, or (2) the design flow is met by two pumps with a third stand-by pump sized at half the load. When multiple pumps are used in parallel, check valves on the discharge of each pump are required to avoid "short circuiting". Pumps can also utilize common headers to allow one pump to serve multiple duties (headered primary pumps serving multiple chillers). Refer to Primary Pumps, page 52 for more information on primary pumps. Riding the pump curve is typically used on small systems with limited flow range. Staging on pumps was the traditional method until VFDs. Today, VFDs are the most common method for varying flow. They are the most efficient method as well. System flow is usually controlled by maintaining a pressure differential between the supply and return lines. The measuring point should be at or near the end of the pipe runs as opposed to being in the mechanical room to reduce unnecessary pump work. This is particularly true for direct return systems. Figure 12 shows the differential pressure sensor located at the end of the piping run. At design load, the pressure drop across coil 1 is 60 ft while the pressure drop across coil 5 is only 30 ft. Then differential pressure controls should be set up to maintain 30 ft. When only coil 1 is operating, the pressure differential across coil 1 will only be 30 ft if the differential sensor is located at the end of the run as shown. If the sensors had been near the pumps, however, the differential controller would have to have been set for 60 ft to meet the design requirements. When only coil 1 operates, the pressure would have been maintained at 60 ft, which would have wasted pump work. Another method of controlling variable flow pumps is to monitor the valve positions of a control valve in a critical part of the system. This valve is typically the furthest from the pumps. The control system then maintains the minimum pressure differential necessary, which allows the valve to maintain setpoint. The advantage of this approach is the system pressure is maintained at the minimum required to operate properly and that translates into minimum pump work. When multiple pumps are required to be variable flow, such as the secondary pumps of a primarysecondary system, VFDs are recommended on all pumps. Consider a system with two equal pumps, both are required to meet the design flow. Pump 1 has a VFD while pump 2 does not. From 0 to 50% flow, pump 1 can be used with its VFD. Above 50%, the second pump will be required. When pump 2 is started, it will operate at design speed. It will overpower pump 1, which will need to operate at less than design speed and will not generate the same head. 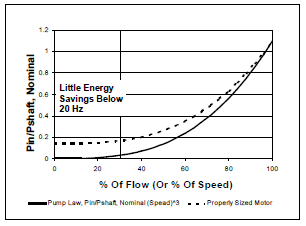 Figure 13 shows percent pumping power as a function of percent flow. From this figure, it can be seen that VFD pumps will not save much energy below 33% or 20Hz. Operating pumps much below 30% starts to create problems for motors, chiller minimum flows, etc. Since there are minimal savings anyway, the recommended minimum frequency is 20 Hz. Pump work is deceptive. Although the motors tend to be small (when compared to chiller motors), they operate whenever the chiller operates. In a single water-cooled chiller plant with constant chilled water flow, it is not unusual for the pumps to use two-thirds of the energy consumed by the chiller. Optimal use of pumps can often save more energy than any other improvement to a chiller plant. When both motors and VFDs operate at less than 100% capacity, their efficiency drops off. 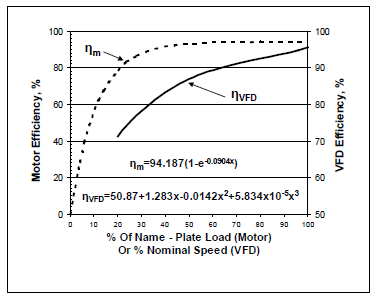 Figure 14 shows motor and VFD efficiencies at part load. It can be seen that oversizing motors can lead to significantly poorer performance than expected. Oversizing pumps themselves also leads to wasted energy. If the pumps produce too much flow, the flow will be throttled, usually with a balancing valve, to meet the desired flow. This creates an unnecessary pressure drop and consumes power all the time the pump operates. The solution in most cases, is to trim the impeller. 3 Bernier, Michel., Bernard Bourret, 1999. Pumping Energy and Variable Speed Drives. ASHRAE Journal, December 1999. ASHRAE. Atlanta, Ga.
□ Individual pumps with over 100- head and a 50-hp motor shall be able to operate at 50% flow with 30% power. □ The differential pressure shall be measured at or near the furthest coil or the coil requiring the greatest pressure differential. □ Where minimum flow interferes with proper operation of the equipment (i.e., the chiller) and the total pump horsepower is less than 75. □ Systems with no more than 3 control valves. Cooling towers are used in conjunction with water-cooled chillers. 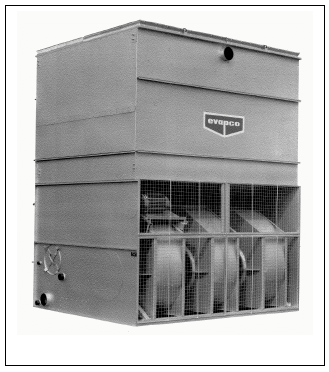 Air-cooled chillers do not require cooling towers. A cooling tower rejects the heat collected from the building plus the work of compression from the chiller. There are two common forms used in the HVAC industry: induced draft and forced draft. Induced draft towers have a large propeller fan at the top of the tower (discharge end) to draw air counterflow to the water. They require much smaller fan motors for the same capacity than forced draft towers. Induced draft towers are considered to be less susceptible to recirculation, which can result in reduced performance. Forced draft towers have fans on the air inlet to push air either counterflow or crossflow to the movement of the water. Forward curved fans are often employed. They use more fan power than induced draft but can provide external static pressure when required. This can be important if the cooling tower requires ducting, discharge cap or other device that creates a pressure drop. Condenser water is dispersed through the tower through trays or nozzles. The water flows over fill within the tower, which greatly increases the air-to-water surface contact area. The water is collected into a sump, which can be integral to the tower or remote from the tower. The latter is popular in freezing climates where the condenser water can be stored indoors. Either tower type can have single or multiple cells. The cells can be headered together on both the supply and return side with isolation valves to separate the sections. This approach allows more cells to be added as more chillers are activated or to allow more tower surface area to be used by a single chiller to reduce fan work. The Cooling Tower Institute (CTI) rates cooling towers at 78oF ambient wetbulb, 85oF supply water temperature and a 10oF range. Since it is common (but not necessary) to use a temperature range of 10oF, the cooling tower flow rate will be 3.0 gpm/ton compared to the chilled water flow rate which is 2.4 gpm/ton. The extra condenser water flow rate is required to accommodate the heat from the work of compression. Cooling towers are very versatile and can be used over a wide range of approaches, ranges, flows and wetbulb temperatures. Lower condenser water temperatures can be produced in many climates with low wet bulb temperatures which significantly improves chiller performance. Cooling towers expose the condenser water directly to the ambient air in a process that resembles a waterfall. The process can cool condenser water to below ambient drybulb. The water is cooled by a combination of sensible and latent cooling. A portion of the water evaporates which provides the latent cooling. The example on page 18 shows the cooling tower process on a psychrometric chart at ARI conditions. As the wetbulb temperature drops, cooling towers rely more on sensible cooling and less on latent cooling. Ambient air below freezing can hold very little moisture which leads to large plumes; and in some cases the winter tower selection requires a larger tower than the summer conditions. Additional care should be taken when selecting cooling towers for use in winter. The above psychrometric chart shows the cooling tower process at ARI conditions. Assume 1 lb. of water is cooled by 1 lb. of air. The water cools from 95oF to 85oF and releases 10 Btus of heat to the air ( 1 Btu = the amount of heat required to raise the temperature of 1 lb. of water, 1oF). The 10 Btus of heat raises the enthalpy of air from 42.4 Btu/lb. to 52.4 Btu/lb. and saturates the air. The leaving air condition is 87.5oF and 100% RH. The moisture content went from 0.018 lb.w to 0.029 lb.w. This means 0.029- 0.018 lb. = 0.011 of water was evaporated which is why it is common to hear that cooling towers lose about 1% of their water flow to evaporation. The latent heat of vaporization for water at 85oF is about 1045 Btu/lb. Multiplying the latent heat times the amount of evaporated water (1045 × 0.011) results in 11.45 Btus of cooling effect. Cooling the water required 10 Btus, the rest was used to cool the air sensibly. The air entered the tower at 95oF and left the tower at 87.5oF. Approximately 1% of the design condenser water flow is evaporated (See the above example). A 1000-ton chiller operating at design conditions can consume 1800 gallons of water per hour. The specific amount can be calculated by reviewing the psychrometric process. In locations where the cost of water is an issue, air-cooled chillers may provide a better operating cost despite the lower chiller performance. Cooling towers required to work in freezing winter environments require additional care. The condenser water must not be allowed to freeze particularly when the tower is idle. Common solutions include electric or steam injection heaters or a remote sump within the building envelope. The high RH of ambient winter air results in a plume, which can frost over surrounding surfaces. Low plume towers are available. Finally, freezing of condenser water on the tower itself can lead to blockage and reduced or no performance. 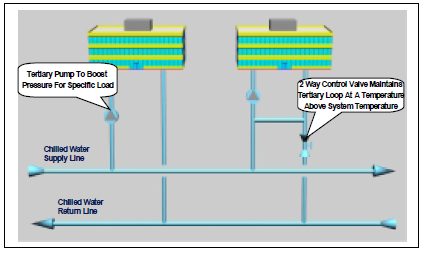 Modulating water flow through a cooling tower (such as the use of threeway chiller head pressure control) should be given careful consideration. In many instances this can lead to increased possibility of freezing the tower. Condenser water has all the right ingredients for biological growth; it is warm, exposed to air and provides surfaces to grow on. In addition, the constant water loss makes water treatment even more difficult. Both chemical and ozone-based treatment systems are used. A thorough discussion on the topic of water treatment is beyond the scope of this Guide but it suffices to say, that it is necessary to provide the proper operation of both the tower and the chiller. Cooling towers differ from closed-circuit coolers in that closed-circuit coolers reject heat sensibly while cooling towers reject heat latently. Consider ambient design conditions of 95oF DB and 78oF wb. If closed circuit coolers are used, the condenser water must be warmer than the ambient drybulb (typically 10oF warmer or 105oF). This raises the condensing pressure in the chiller and requires more overall power for cooling. Closed circuit coolers are larger than cooling towers for the same capacity and can be difficult to locate on the roof. Cooling tower controls provide condenser water at the correct temperature to the chillers. Defining correct water temperature is very important. Lowering the condenser supply water temperature (to the chiller) increases the effort by the cooling tower and more fan work can be expected. It also improves the chiller performance. 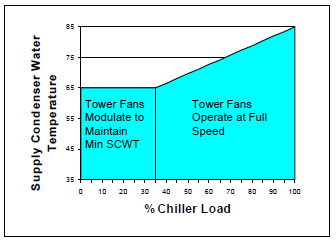 Figure 17 shows the relationship between chiller and tower work. 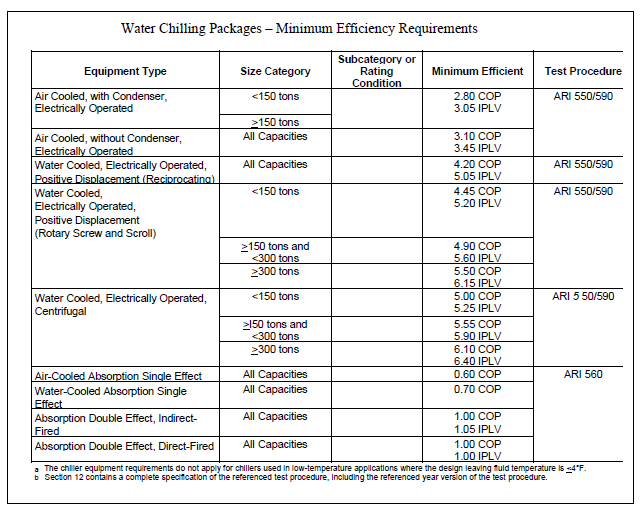 Table 2 shows the range of chiller improvement that can be expected by lowering the condenser water supply temperature. The goal of cooling tower control is to find the balance that provides the required cooling with the least use of power by the chiller plant. Cooling towers are often provided with aquastats. This is the most basic level of control. They are popular for single chiller-tower arrangements because the control package can be supplied as part of the cooling tower. The aquastat is installed in the supply (to the chiller) side of the cooling tower. In many cases, the setpoint is 85oF, which is very poor. 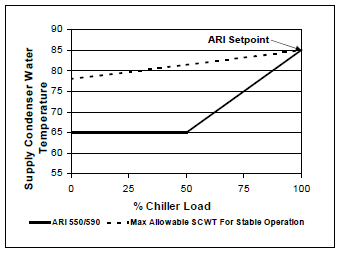 Figure 18 shows the 85oF setpoint and the ARI condenser relief curve which chillers are rated at. Maintaining 85oF condenser water, while saving cooling tower fan work, will significantly penalize the chiller. There is some risk that without some condenser relief, the chiller may not operate at lower part load conditions (The chiller may surge). 4 Braun, J.E., and G.T. Diderrich. 1990. 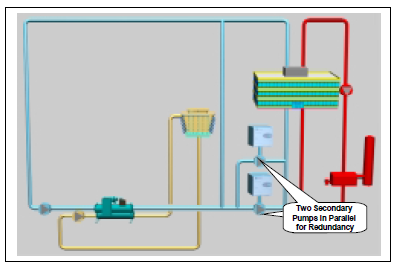 Near-Optimal Control of Cooling Towers For Chilled Water Systems. ASHRAE Transactions SL-90-13-3, Atlanta, Ga. If aquastats are going to be used, then a lower setpoint than 85oF should be used. One recommendation is to set the aquastat at the minimum condenser water temperature acceptable to the chiller. The cooling tower will then operate at maximum fan power and always provide the coldest possible (based on load and ambient wet bulb) condenser water to the chiller until the minimum setpoint is reached. Then the tower fan work will stage down and maintain minimum setpoint. Minimum chiller setpoints are not a specific temperature. They change depending on the chiller load. A conservative number such as 65oF is recommended. Another method to control cooling towers dedicated to single chillers is to use the chiller controller. Most chiller controllers today have standard outputs which can operate cooling towers, bypass valves and pumps. The chiller controller has the advantage of knowing just how much cooling is actually required by the chiller for optimum performance. chiller work and cooling tower fan work. A method to control either single cell or multiple cell cooling towers serving multiple chillers is to base the condenser supply water temperature on ambient wetbulb. For this method, set the condenser water setpoint at the current ambient wetbulb plus the design approach temperature for the cooling tower. The set-point will change as the ambient wetbulb changes. Limit the setpoint between the design condenser water temperature (typically 85oF) and the minimum condenser water temperature (typically 65oF). The wetbulb method will provide good condenser relief for the chiller and cooling tower fan work relief when the chiller is not operating at 100% capacity. It can be a good balance between chiller and tower work. Ultimately, the best cooling tower control designs are part of a chiller plant optimization program. These programs monitor the weather, the building load and the power consumption of all the components in the chiller plant including cooling towers. Using modeling algorithms, the program calculates the best operating point to use the least power possible and meet the requirements of the building. Cooling towers consume power to operate the fans. Induced draft towers should be selected since they typically use half the fan horsepower force draft towers use. Some form of fan speed control is also recommended such as piggyback motors, multi-speed motors or Variable Speed Drives (VFDs). In addition, a sensible controls logic is required to take advantage of the variable speeds. □ Condenser fans serving multiple refrigeration circuits. □ Installations in climates with greater than 7200 CDD50. □ Up to one-third of the fans on a condenser or tower with multiple fans, where the lead fans comply with the speed control requirement. Chilled water coils are used to transfer the heat from the building air to the chilled water. The coils can be located in air handling units, fan coils, induction units, etc. The air is cooled and dehumidified as it passes through the coils. The chilled water temperature rises during the process. Cooling coil performance is not linear with flow. Cooling coils perform 75% cooling with only 50% chilled water flow and 40% cooling with only 20% flow. As well, the leaving water temperature will approach the entering air temperature as the load is reduced. Process loads can reject heat in the chilled water in a variety of ways. A common process load is a cooling jacket in machinery such as injection molding equipment. Here the chilled water absorbs the sensible heat of the process. Control valves are used to maintain space temperature conditions by altering chilled water flow. Valves can be broken down into groups in several ways. Valves can be two-position or modulating. Two-position valves are either on or off. Control comes from time weighting. The percentage that the valve is open over a certain time period dictates the amount of cooling that the cooling coil actually does. Modulating valves vary the flow in response to the actual load at any given time. Valves can also be classified as two-way or three-way type. Two-way valves throttle flow while three divert flow. Refer to Piping Diversity, page 24 for further explanation. There are several different physical types of valves. Globe valves, ball valves and butterfly valves are all commonly used in the HVAC industry. Different kinds of valves have different valve characteristics. Common characteristic types include linear, equal percentage and quick opening. Control valves used with cooling coils need to have a performance characteristic that is "opposite" to the coil. Equal percentage control valves are typically used for two-way applications. For three-way applications, equal percentage is used on the terminal port and linear is used on the bypass port. Figure 21 shows an equal percentage control valve properly matched to a cooling coil. The result is that the valve stem movement is linear with the cooling coil capacity. In other words, a valve stroked 50% will provide 50% cooling. Control valves must be sized correctly for the chilled water system to operate properly. An incorrectly sized control valve cannot only mean the device it serves will not operate properly, it can also lead to system-wide problems such as low delta T syndrome. Cv is the valve coefficient. ΔP is the differential pressure required across the control valve. The required flow at a control valves is defined by the needs on the device (fan coil, unit ventilator or AHU) it serves. Cv values for valves are published by valve manufacturers. The required pressure differential through the valve is the difficult parameter to define. Figure 22 shows typical pressure drops from the supply to the return line for a cooling coil. For a modulating valve, the valve pressure drop should be as large a percentage as possible when compared to the system pressure drop; preferably over 50%. The reason is to maintain valve authority. For on-off control, any valve can be used as long as it can pass the required flow rate with the pressure differential available. the line size it is installed in. As a control valve closes, the pressure drop across the valve increases so that when the valve is completely closed, the differential pressure drop across the valve matches the pressure drop from the supply to the return line. This pressure drop is known as ΔPMax. When the valve is completely open, the pressure drop across the valve is at its lowest point and is referred to ΔPMin. 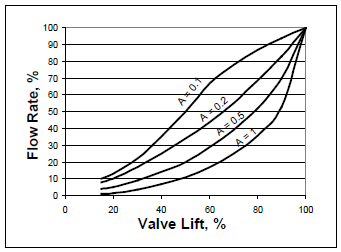 The ratio (β) ΔPMin / ΔPMax is the valve authority. The increase in pressure drop across the valve as it closes is important to note. Valves are rated based on a constant pressure drop. As the pressure drop shifts, the performance of the valve changes. The method to minimize the change in valve performance is to maintain the Valve Authority (β) above 0.5. Figure 23 shows the change in the valve characteristic that occurs at different Valve Authorities. Since the goal is to provide a valve with a performance characteristic that is the opposite of a coil characteristic (See Figure 21), it is important to maintain Valve Authority above 0.5. Consider a control valve with a Cv = 25 serving a coil that has a design flow of 50 US gpm. The pressure differential from the supply to the return line is 16 PSI. Q = Cv (ΔP)1/2 = 25(16) 1/2 = 100 US gpm. This does not actually happen, however, since the pressure drop through the coil, balancing valve, etc. 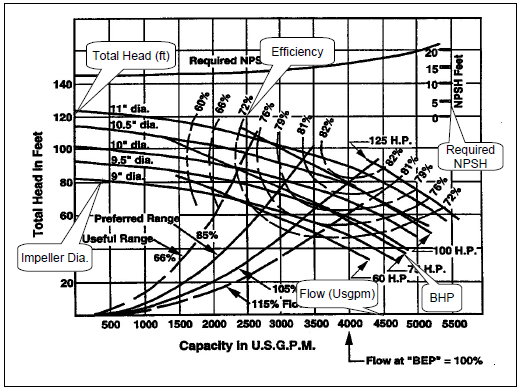 increases and limits flow to 50USgpm. In this case, the valve authority (β) is 4 PSI/16 PSI = 0.25. Referring to Figure 23, it can be seen that the valve performance characteristic is distorted and when matched to a cooling coil will not provide a linear relationship between valve position and coil output. This can lead to poor coil performance and low delta T syndrome. The solution is to try and keep the valve authority above 0.5. In other words, the pressure drop though the control valve when it is fully open should be at least 50% of the pressure drop from the supply to return line. Rangeablity is a measure of the turndown a control valve can provide. The larger the range, the better the control at low loads. Typical ranges for control valves are 15:1 to 50:1. Proper valve selection requires knowing the pressure drop from the supply to the return wherever the device is located. This information is typically not made available to the controls contractor which often leads to guessing. One solution would be for the designer to provide the required Cv for each valve. Another solution would be to provide the estimated pressure drops for each valve. Because the pressure drop from the supply to the return changes throughout the system, it can be expected that different valves with different Cvs will be required. Even if all the coil flows and pressure drops were identical, the valves should change depending on location in the system. Lack of attention to this detail can lead to low delta T syndrome (refer to Low Delta T Syndrome, page 80) that can be very difficult to resolve. There are two parameters that need to be considered for the chilled water loop. These are temperature and flow. The loop supply temperature is usually controlled at the chiller. The unit controller on the chiller will monitor and maintain the supply chilled water temperature (within its capacity range). The accuracy to which the chiller can maintain the setpoint is based on the chiller type, controller quality (a DDC controller with a PID loop is the best), compressor cycle times, the volume of fluid in the system, etc. Systems with fast changing loads (especially process loads) and small fluid volumes (close coupled) require special consideration. The system flow control occurs at the load. To control the cooling effect at the load, two-way or three-way valves are used. Valve types are discussed in Control Valve Basics, page 20. Valve selection will also touch on piping diversity and variable vs. constant flow. Another method to control cooling is face and bypass control at the air cooling coil while running chilled water through the coil. This approach has the advantage of improved dehumidification at part load and no waterside pressure drops due to control valves. The disadvantage is the requirement for continuous flow during any mechanical cooling load. In many cases the pressure drop savings will offset the continuous operation penalty but only annual energy analysis will clarify it. Face and bypass coil control is popular with unit ventilator systems with their required high percentage of outdoor air, and make-up air systems. Diversity in piping is based on what type of valves are used. To maintain the correct space condition, three-way or two-way control valves are used. Threeway control valves direct chilled water either through or around the coil to maintain the desired condition. If all the loads on the loop use three-way valves, then the chilled water flow is constant. The temperature range varies directly with the load. That is, if the design chilled water temperature range is 10oF, then every 10% drop in system load represents a 1oF drop in temperature range. A system incorporating three-way control valves is easy to design and operate. The system pumps all the water all the time, however this requires more pump horsepower. In most cases the chiller is sized for the building peak load. Due to diversity, not all the connected loads will "peak" at the same time as the building peak load. However, the pumps and piping system must be designed for full flow to all the control valves all the time. Since the chiller flow rate is the same as the flow rate through all the loads (they're connected by the same piping system and pump) the diversity is applied to the chiller temperature range. However, an 80-ton chiller with 240 gpm will only have a temperature range of 8oF. The lower chiller temperature range is not a problem for the chiller operation, but it will lower the chiller efficiency. Care must be taken to select the chiller at the proper temperature range. When two-way modulating control valves are used, the flow to the coil is restricted rather than bypassed. If all the valves in the system are two-way type, the flow will vary with the load. If the valves are properly selected, the temperature range remains constant and the flow varies directly with the load. In this case the diversity is applied to the chilled water flow rate. Using the previous example, the peak load is 80 tons and the design flow is 2.4 × 80 tons or 192 gpm. The connected load is still 100 tons and requires 240 gpm if all the two-way control valves are open at the same time. The 80% diversity assumes only 80% of the valves will be open at the peak load. The advantage of two-way control valves is both the pump and the piping are sized for a smaller flow rate, offering both first cost and operating savings. The difficulty is that the chiller and control system must be designed for variable flow. The chiller has a minimum flow rate so the piping design has to allow for enough flow during all operating conditions to meet the chiller minimum flow rate. Using two-way valves is the main building block for a variable flow system. Selection of temperature ranges can affect the chiller plant operation and energy usage. The limiting temperatures are the required supply air temperature and either the ambient wetbulb (water or evaporatively cooled chillers) or drybulb (air cooled chillers) temperatures. Once these have been identified, the HVAC system must operate within them. The chilled water supply temperature is tied to the supply air temperature. The chilled water temperature must be cold enough to provide a reasonable log mean temperature difference (LMTD) (Refer to McQuay , for more information on LMTD) for a cooling coil to be selected. Traditionally this has resulted in a 10oF approach which, when subtracted from 55oF supply air temperature, has led to the 44 or 45oF chilled water temperature. Lowering the chilled water temperature will increase the approach allowing a smaller (in rows and fins and hence air pressure drop) coil to be used. It will also increase the lift that the chiller must overcome and that will reduce the chiller performance. The air pressure drop savings for small changes (2 to 4oF) in the approach do not generally save enough in fan work to offset the chiller penalty. This is particularly true for VAV where the pressure drops inside an air handling unit follow the fan affinity laws. The power required to overcome the coil pressure drop decrease by the cube root as the air volume decreases. A 20% decrease in airflow results in a 36% decrease in internal air pressure drop and a 49% drop in bhp. Increasing the chilled water temperature range reduces the required flow rate and consequently the pump and piping sizes. In some situations, the savings both in capital cost and operating cost can be very large. Increasing the chilled water temperature range while maintaining the same supply water temperature actually improves the chiller performance because the chiller log mean temperature difference increases. It has just the opposite effect on the cooling coil where the LMTD decreases between the air and the chilled water. In some cases, it may be necessary to lower the supply water temperature to balance the chiller LMTD with the coil LMTD. 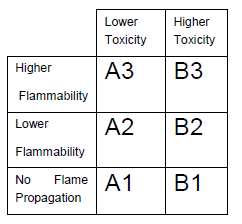 Table 3 provides suggested supply water temperatures for various ranges. The best balance of supply water temperature and range can only be found through annual energy analysis. Every project is unique. The McQuay Energy Analyzer™ can be used to quickly evaluate the pump savings vs. chiller penalty. Products such as fan coils and unit ventilators have standardized coils designed to work with 10 to 12oF chilled water range. When these products are used with this range of chilled water, they provide the sensible heat ratio and return water temperature generally required. When the range is increased, the coils may not provide the necessary sensible heat ratio and return water temperature. It is recommended that for these products, the chilled water range stay close to industry standard conditions. Chilled water coils are designed for the application-specific conditions so this is generally not an issue. Increasing the condenser water temperature range reduces the condenser water flow, which requires smaller pumps and piping. It also increases the required condenser pressure while improving the LMTD for the cooling tower. Increasing the condensing pressure on the chiller will result in a combination of increased chiller cost and reduced performance. Improving the cooling tower LMTD allows a smaller tower to be used, but the savings from this strategy will not generally offset the increased cost of the chiller. In most cases, the overall design power requirement will go up. At full load conditions, the increased chiller power requirement to overcome the increased lift will more than offset the savings from the smaller cooling tower fan and condenser pump. This will depend on the head requirement of the condenser pump. As the chilled water load decreases, the chiller and cooling tower work will reduce but the condenser pump work will remain the same. At some part load operating point, the savings from the smaller condenser pump will offset the chiller penalty and for all operating points below this, the increased condenser range will save energy. Whether an increased condenser temperature range will save energy annually will depend on when the crossover point occurs (the pump motor size) and the chiller operating profile (whether the operating hours favor the chiller or the pump). This can only be found with annual energy analysis. □ The traditional ARI operating conditions work very well for many buildings. □ Unnecessary reduction of the chilled water supply temperature should be avoided as it increases chiller work. □ When using standard products such as fancoils and unit ventilators, maintain the chilled water temperature range between 10 and 12oF where they are designed to operate. □ Increasing the chilled water temperature range is a good way to reduce the capital and operating cost of a building, particularly if the pump head is large or the piping runs long. □ With larger chilled water temperature ranges it may be necessary to lower the supply water temperature to find a balance between coil and fan performance vs. chiller performance. Annual energy analysis using the McQuay Energy Analyzer™ is recommended. □ If the chilled water supply temperature is reduced, consider oversizing the cooling tower to reduce the condenser water temperature and minimize the affect on the chiller. □ Always take into account the actual design ambient drybulb or wetbulb conditions when designing a chiller plant. If the location is arid, then lower the wetbulb design as per ASHRAE design weather data and select both the cooling tower and chiller accordingly. □ For very large chilled water ranges, use series chillers possibly with series counterflow condenser circuits to optimize chiller performance. □ Increasing the condenser water range should only be considered for projects where the piping runs are long and the pump work high. 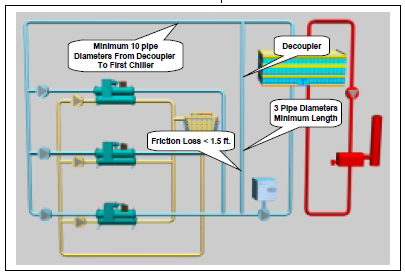 When it is required, optimize the flow to the actual pipe size that is selected and select the chillers accordingly. Consider oversizing the cooling towers to minimize the affect on the chiller. □ Use the McQuay Energy Analyzer™ to evaluate various temperature range supply water temperature combinations. Design condition performance is not an accurate indicator of the annual energy usage. The choice of chiller type and chiller plant design are inherently linked. Different chiller types have different strengths and by careful selection of chiller plant design, these strengths can be optimized. Most large plants consist of centrifugal water cooled chillers. Hybrid plants (discussed in Hybrid Plants, page 66) may also include absorption chillers. Many small to medium chiller plants use air cooled chillers with air-cooled screw chillers being common in the 150 to 400- ton range. Air-cooled screw chillers offer very good performance particularly at part load. The compressors are modulating rather than stepped which provides more accurate control. Air cooled chillers avoid the need for cooling towers, condenser pumps and condenser piping which can offer substantial capital savings. Air cooled chillers do not require mechanical room space which offers additional savings. ☺Tip: Air cooled chillers do not require mechanical room space. To estimate the savings use$50/ft2. Another advantage of aircooled chillers is they do not consume water like watercooled chillers. A 400-ton chiller will consume over 700 gallons per hour to offset cooling tower makeup. Where water is scarce, this can be a significant cost. In addition, condenser water treatment is avoided. Air-cooled chillers have lower performance (consume more power) than water or evaporatively cooled chillers because of the increased lift. Refrigeration work is proportional to lift; doubling the lift will approximately double the work required. (For this purpose, consider lift to be the difference between chilled water supply and either cooling tower supply or ambient air drybulb) Since aircooled chillers must raise the refrigerant temperature above ambient drybulb, they consume more power. Both chiller types will improve chiller performance when the lift is reduced. This is often referred to as condenser relief. 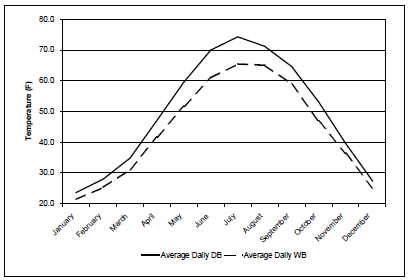 Figure 28 shows the annual drybulb vs. wetbulb temperature for Chicago. 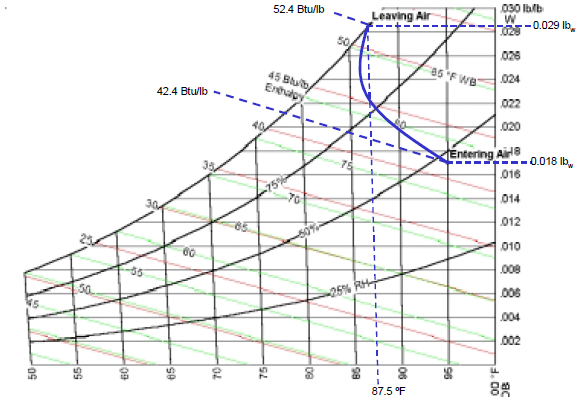 The curves show the amount of available condenser relief for each type of chiller. As expected, the wetbulb based (water-cooled) chillers offer the best performance at design conditions, however, the relief during spring and fall seasons quickly reduces the difference. In the winter, there is no advantage, as either system will operate at the minimum condensing temperature permissible by the refrigeration system. Understanding the overall annual performance is important when considering the building use. For example, schools are rarely operating at design conditions during the summer months due to reduced occupancy. This has the effect of limiting the advantage water-cooled chillers have over air- cooled chillers. Water-cooled chiller systems usually out perform air cooled chiller systems. However, when considering life cycle analysis, the payback for water-cooled systems can be very long. In climates where freezing conditions exist, winter operation must be considered. There are two issues to deal with. The first is the necessary changes to the chiller to operate in cold temperatures. All chillers have a minimum condensing temperature. Going beyond that temperature may damage the chiller. To protect the chiller, the condensing fans are staged off, or slowed down to maintain the correct condensing temperature. In very cold climates, a flooded system may be required. There are other changes that are required as well, such as larger crankcase heaters. Consult your sales representative to discuss these requirements. □ Heat trace the piping and evaporator. This is a good solution where freezing weather occurs but is not extensive. It is also a good backup for systems that are to be drained in the winter. Many chillers already include evaporator tracing. Check with your sales representative. □ Add antifreeze. A common solution is to add either propylene or ethylene glycol to the chilled water. While this will resolve the freezing issue, it will increase pumping work and de-rate both the chiller and chilled water coils. Maintaining the correct level of antifreeze in the system becomes an additional maintenance issue. A loss of antifreeze in the system due to flushing or a leak and subsequent water make-up can allow the chilled water loop to become vulnerable to freezing. Adding glycol to a system that was not designed to have it must be carefully examined to ensure the system will operate properly. □ Relocate the evaporator barrel inside the building envelope. Relocating the evaporator avoids antifreeze but will require field refrigerant piping. There are also limitations on piping distances and elevation changes. Consult your sales representative to discuss the details. □ Use an indoor chiller with a remote air-cooled condenser. This arrangement will require mechanical room space, however, the equipment can be serviced from within the building. This is a very good solution for very cold climates. The compressors are indoors and flooded condensers can easily be added. Air-cooled chillers will affect the system selection and design details. In most cases, air-cooled chillers are limited in evaporator shell arrangements when compared to centrifugal chillers. They are designed to work well around the ARI 550/560 design conditions (54oF EWT, 44oF EWT). The design temperature range should stay within 20% of these operating conditions. Series chiller arrangements will typically double the flow and half the temperature change in the evaporator. This can lead to very high water pressure drops. Contact your sales representative to review the acceptable performance ranges of the various chiller options. Air-cooled chillers can be used in any chiller system design. They are commonly used in single, parallel and primary/secondary systems. They can be mixed with water cooled chillers in multiple chiller applications. Most air-cooled chillers can be used in either constant or variable flow applications. Variable flow in the evaporator is a function of the staging and chiller controller. Check with your sales representative when designing variable primary flow systems. There are many applications that require a small amount of chilled water during the winter. For example, a hospital might require chilled water to cool an MRI year-round while the AHUs can switch to air-side economizers in the winter. When there is a requirement for small amounts of chilled water in winter, an air-cooled chiller is an excellent solution. 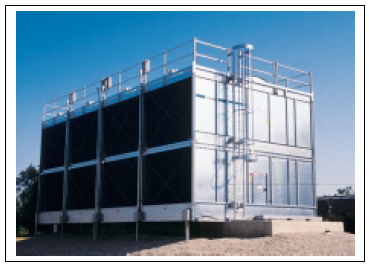 An air-cooled chiller avoids the need to operate a cooling tower in cold (freezing) weather. In addition, the air-cooled chiller will offer equal performance to a water-cooled chiller at low ambient conditions. Evaporatively-cooled chillers are essentially water-cooled chillers in a box. The hot gaseous refrigerant is condensed by water flowing over the condenser tubes and evaporating. This ties the condensing temperature to ambient wetbulb like a water-cooled chiller. The condenser, water sump and pump, etc., are all integral to the chiller. Whereas a watercooled chiller will require a cooling tower, condenser pump and field erected piping, the evaporatively-cooled chilled comes as a complete package from the factory. Evaporatively-cooled chillers offer the ease and savings of air-cooled chiller installation while providing performance comparable to water-cooled chillers. Evaporatively-cooled chillers will require makeup water, water treatment and drains. Evaporatively-cooled chillers are often associated with hot, dry climates such as the American Southwest. However, they should be considered wherever watercooled chillers make sense. Evaporatively-cooled chillers can be used in any system design. They have similar limitations as air-cooled chillers (Refer to Air-Cooled Chiller System Design, page 29). 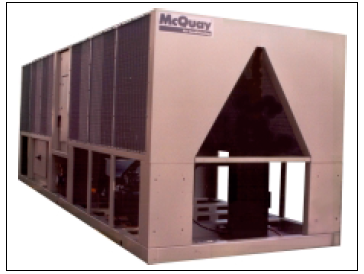 The unique performance of both McQuay dual compressor and variable frequency drive chillers affect the chiller plant design. While it is satisfactory to simply switch conventional chillers with either dual or VFD chillers in the chiller plant, to take full advantage of these chillers capabilities, the design should be modified. The built-in redundancy of a dual compressor chiller allows the designer to use fewer chillers and still provide the owner with backup equipment. This can save considerable capital expense in installation costs. VFD chillers use a combination of VFDs and inlet guide vanes to modulate the capacity of the chiller. The VFD is used to change the speed of the compressor. For information on how this works, refer to McQuay AG 31-002, Centrifugal Chiller Fundamentals. The performance savings are obtained when the VFD is used rather than the inlet guide vanes. Typical VFD chiller NPLV is about 0.386 kW/ton. The VFD can only be used when the lift on the compressor is reduced. The lift is reduced either when the chiller load is decreased or when the condenser water temperature is lowered and/or the chilled water temperature is raised. When the lift is reduced and the VFD can be used, the chiller will operate much more efficiently at part load than a conventional chiller does. The best way to take advantage of a VFD chiller is to reduce the condenser water temperature as much as possible. Climates with reasonable annual changes in wetbulb are prime candidates for VFD chillers. Both dual compressor and VFD chillers operate much more efficiently at part load. Conventional chillers operate most efficiently at or near full load. To fully optimize a dual or VFD chiller, the design should take advantage of their part load performance. Figure 32 is based on two equally sized chillers in a primary/secondary arrangement using the ARI condenser relief profile for the entire plant. At the 50% load point, the second chiller must be started. For conventional chillers, the chiller performance drops because the load is split evenly between the two chillers and they unload to a less efficient operating point. The dual and VFD chillers actually improve their performance because the chillers are unloaded and there is condenser relief available. Considering that most buildings experience a significant number of operating hours around 50% plant load, the dual or VFD chillers may offer appreciable savings even when used in a convention manner. 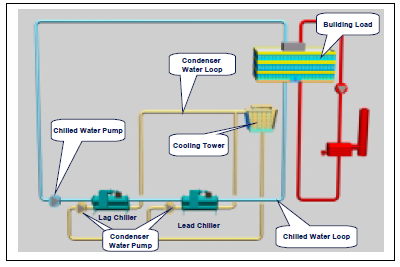 The first chiller that is activated in a plant, typically called the lead chiller, operates with many hours at reduced load and condenser water temperature. An example is a multi-chiller primary /secondary plant. The lead chiller sees optimal conditions for either a VFD or a dual compressor chiller. The other chillers in the plant can be conventional chillers. Each chiller that is started as the plant load increases will operate at a higher percent load with less condenser water relief and therefore will offer fewer savings. Another good application for a dual or VFD chiller is winter load applications. Building using fancoils have considerable chiller plant loads even in winter. Other buildings such as hospitals or office buildings with computer, telecommunications or other winter chilled water loads can also take advantage of a dual or VFD chiller. In many cases, these winter loads are relatively small. Conventional thinking would require a smaller chiller sized specifically for the load. With a dual or VFD chiller, there may not be a performance penalty to use a larger chiller sized for summer loads to handle the small winter load. The peripheral loads such as pumps should be checked when evaluating performance. A common method for sizing chillers used in series is to select both chillers to be able to perform as the lead chiller (See Series Chillers, page 44). The causes the lag chiller to be sub-optimized because the lift is reduced in the lag position. By using a VFD chiller as the upstream chiller, the VFD can take advantage of the reduced lift when operating as the lag chiller. In addition, the same chiller can be used as the lead chiller during light loads when there should be condenser water relief available. Selecting the chillers to be different sizes can improve chiller plant performance based on the building load profile (see Varying Chiller Sizes, page 57). Using either a dual or VFD chiller for that larger chiller can enhance the savings. Consider a 1200-ton plant consisting of an 800-ton dual compressor and a 400-ton single compressor chiller. The dual compressor chiller can accommodate the plant load up to 800 tons. Above that, the second chiller must be started and both chillers will initially operate at 67%. The larger chiller will be more efficient when unloaded. Most variable flow chiller plants will see a drop in return water temperature as the load drops. The low delta T can cause serious operation issues with the plant ( See Low Delta T Syndrome, page 80). One solution is to use either dual or VFD chillers and operate two chillers at part load as opposed to one chiller fully loaded. The dual or VFD chillers partly loaded should be more efficient than one conventional chiller fully loaded. The chiller savings can be used to offset the additional pumping cost from operating peripheral pumps. Moreover, this arrangement will provide the necessary chilled water flow on the primary side to offset the low delta T problem. When estimating the savings, consider both the type of chillers used and the available lift reduction (condenser relief) and peripheral equipment that must be operated. 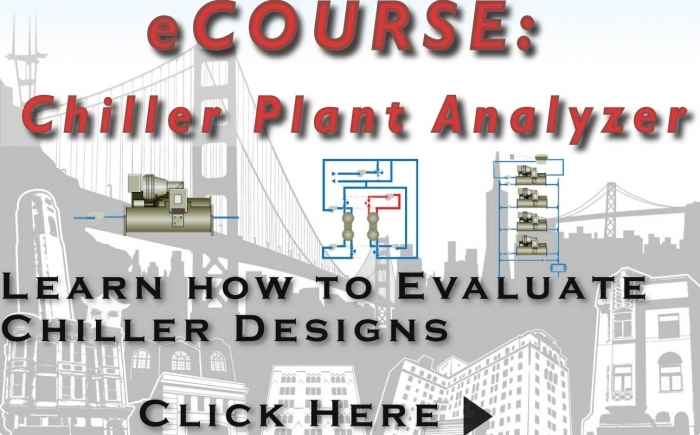 Many combinations of plant design can be quickly modeled using the McQuay Energy Analyzer™. Chillers represent large, powerful machines filled with refrigerants. When chillers are placed in confined spaces, care must be exercised to provide safety to the equipment operator and the public at large. 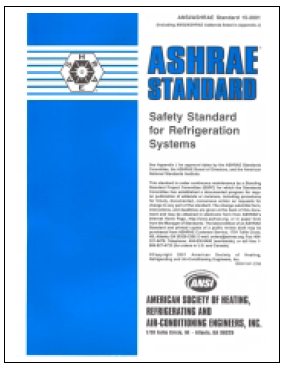 ASHRAE Standard 15-2001, Safety Standard for Refrigeration Systems and ASHRAE Standard 34- 2001, Designation and Safety Classification of Refrigerants, provides the designer with excellent sources when designing a chiller mechanical room. In Canada, CSA –B52, provides similar information. The following is a brief summary of the safety requirements covered by these documents as they apply to chiller mechanical rooms. This section is by no means a complete review of all requirements covered by these standards. It is recommended that the design have access to these documents. ASHRAE plans to publish a users manual for Standard 15, which may also be very helpful. Standard 34 lists refrigerants and provides a safety classification as shown in Figure 34. Refer to Standard 34 or to McQuay Application Guide AG 31-007, Refrigerants for further information on common refrigerants and their safety properties. The purpose of Standard 15 is to specify "safe design, construction, installation, and operation of refrigeration systems6." The following is a brief outline of the issues that affect chiller mechanical room design. The Section numbers refer to ASHRAE Standard 15 sections. Standard 15 identifies seven occupancy types (4.1.1 to 4.1.7) that consider the ability of the occupants to respond to a potential exposure to refrigerant. An example is Institutional Occupancy where it is anticipated that the occupants may be disabled and not capable of readily leaving the building without assistance. A hospital is an institutional building. Section 5 describes various types of refrigeration systems based on how they extract or deliver heat. Chiller plants are considered indirect systems because they cool chilled water, which in turn cools the air. Indirect systems are subsequently subdivided by how the secondary fluid (chilled water) contacts the air stream. Assuming coils are used, the classification is indirect closed system (5.1.2.3). If open spray coil systems are used then the classification becomes either indirect open spray system (5.1.2.1) or double indirect spray system (5.1.2.2). The refrigeration system classification is used to determine the probability that a refrigeration leak would enter the occupied space. Indirect closed systems such as chiller plants are generally considered Low-Probability systems (5.2.2) providing they are either outside the building or in a mechanical room. Standard 15 uses the safety classifications listed in Standard 34. Table 4 of this Guide is based on Table 1 in Standard 15. It shows the group, refrigerant name, formula and the minimum quantity of refrigerant allowed in an occupied area. Blends such as R-407C and R-410a are classified based on the worst case fractionation of the refrigerant. Section 7 describes the restrictions on where refrigerants can be used. It is based on results of Sections 4, 5 and 6. With high probability systems (the refrigerant can enter the occupied space i.e. a spot cooler) the maximum refrigerant level is defined in Table 1 of Standard 15 (7.2). For example R-123 can only have a concentration of 0.4 lb per 1000 ft3 occupied space. Once these levels are exceeded, the refrigeration equipment must be either outdoors or in a mechanical room (7.4). Refrigerant levels involved in chiller plants necessitate mechanical rooms or outdoor equipment. An interesting issue occurs when an air handling unit that serves occupied spaces is in the chiller mechanical room. If a leak occurs, the refrigerant may be drawn into the air handling unit and circulated through the building. The best solution to this is to avoid air handling units in the chiller mechanical room. This may not be possible in existing buildings. Standard 15 does allow AHUs in the chiller mechanical room if they are sealed (8.11.7). Section 8 describes the installation requirements. It has general requirements (8.1 through 8.10) and then requirements for nonflammable (type A1 and B1) refrigerants (8.11). Flammable refrigerants are covered in 8.12 through 8.14. With the exception of ammonia, most common commercial air conditioning refrigerants are either A1 or B1 type. It is important to confirm this, however. □ Foundations for refrigeration equipment shall be non-combustible and capable of supporting the weight (8.1). □ Provide guards for moving machinery (8.2). □ There should be safe access to the equipment for service (8.3). □ Refrigeration components in the air stream must be able to withstand 700oF without leaking. □ There are requirements on where refrigeration piping may be located (8.10). □ Other equipment is not prohibited in the chiller mechanical room unless specifically mentioned. The room must be large enough to allow service and have a clear headroom of 7.25 ft. (8.11.1). □ The mechanical room doors shall be tight fitting that open outward and be self closing if they open into the building. There must be enough doors to allow adequate escape in the event of an emergency. The mechanical room cannot have openings that will allow refrigerant to enter the occupied space in the event of leak (8.11.2). □ Each mechanical room shall have a refrigerant leak detector. The detector shall activate an alarm and ventilation system at a value not greater than the TLV-TWA of the refrigerant. The alarms shall be audio and visual and be located in the mechanical room and at each entrance to the mechanical room. There shall be a manual reset located in the mechanical room. Absorption chillers using water as the refrigerant do not require detectors (8.11.2.1). □ Mechanical fans are required. □ Openings for inlet air must be provided and situated to avoid recirculation. □ Supply and exhaust air ducts shall serve no other area. □ Discharge of exhaust air shall be in such a manner as not to cause a nuisance or danger. by the chiller manufacturer. A good rule of thumb is 3 lbs. G = the mass of refrigerant in pounds in the largest system (i.e., the chiller), any of which is located in the chiller mechanical room. □ General ventilation shall be provided when occupied at a rate of 0.5 cfm/ft2 or 20 cfm/person. The general ventilation rate must be capable of maintaining a minimum 18oF temperature rise above the inlet air or a maximum space temperature of 122oF. □ Natural ventilation is acceptable under certain circumstances such as open structures. Consult Standard 15 for information. □ Combustion air is drawn directly from outdoors or a refrigerant detector is used to shut down the combustion device in the event of a leak (8.11.6). □ There shall be no airflow from the occupied space through the chiller mechanical room unless the air is ducted and sealed in such a manner as to prevent refrigerant leakage from entering the airstream. Access doors must be gasketed and tight fitting (8.11.7). □ Access to chiller mechanical rooms shall be restricted to authorized personnel and clearly marked as restricted (8.11.8). □ The discharge from purge systems (i.e., negative pressure centrifugal chillers) shall be governed by the same rules as pressure relief and fusible plug devices. Absorption chillers using water as the refrigerant are exempt (8.14). Section 9 covers the design and construction of refrigeration equipment. In most cases, the chillers are factory built and the designer will not be directly involved in the equipment design. If there is field refrigerant piping involved such as in a split system, the designer will have to be familiar with this section. One area that will involve the designer is pressure relief devices and piping. The pressure relief devices are typically part of the chiller. With field refrigerant piping, additional relief devices may be required. Medium to high pressure refrigeration systems typically use re-seating spring loaded pressure relief valves. Negative pressure chillers often use rupture disks. Rupture disks are less expensive however, if they burst, the entire charge will be lost. Spring loaded pressure relief valves will re-seat as soon as the pressure within the refrigeration system drops to safe level. For negative pressure chillers, it is recommended that reseating pressure relief valves be used in addition to rupture disks for additional protection. Pressure relief devices and purge unit discharges must be piped to the outdoors (9.7.8). The location must not be less than 15 ft above grade or 20 ft from a window, ventilation opening or doorway. The line size shall be at least the discharge size of the pressure relief device or fusible plug. Multiple relief devices can be connected to a common header. The header size must be at least the sum of the discharge areas of the connected devices and designed to accommodate the pressure drop. Many chiller application catalogs provide tables for sizing relief piping. ASHRAE Standard 15 also includes tables for sizing relief piping. Single chiller systems are the easiest to design and operate but are also the least efficient chiller plant design for buildings. Moreover, they provide no redundancy. If the chiller fails, all cooling is lost. Single chiller plants require the smallest mechanical room, particularly if the chiller is air or evaporatively cooled. Figure 35 shows a single water-cooled chiller plant with constant flow and 80% cooling load diversity. Chilled water is circulated by the chilled water or primary pump through the chiller to the load and back to the chiller. The chilled water loop can be either constant flow or variable flow. Variable Flow systems increase the complexity but offer significant pump work savings. Variable flow systems are covered in Primary/Secondary Systems and Variable Primary Flow Design. A condenser loop is required for water cooled chillers. This includes a condenser pump, piping and a cooling tower or closed circuit cooler. The condenser loop operates whenever the chiller operates. For constant flow systems, the chilled water temperature range varies directly with the load. Depending on the load diversity, the chiller design temperature range will be less than the range seen at each load. In this case, the chiller range is 8oF while the cooling coil range is 10oF (Refer to Piping Diversity, page 24). The overall result is increased chilled water pump and pipe capital cost plus higher annual pumping cost. The chiller is sized to meet the design load of the building or process. For building loads, the chiller only operates at full capacity for a few percent of the time. The balance of the time the chiller is operating in the 50 to 60% range (depending on the building load profile). Most chillers provide their most efficient performance at or near full load. 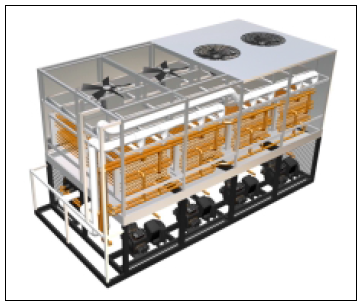 Single chiller plant design does not promote optimal use of the chiller's performance. An exception to this is the McQuay Dual Compressor chiller, which operates at its most efficient point at 50% capacity. In addition, the dual compressor chiller offers complete redundancy of all major mechanical components, which resolves another issue with single chiller plant design. Water-cooled, air-cooled or evaporatively-cooled chillers can be used. Air and evaporatively cooled chillers do not require a condenser loop including piping, cooling tower and pump. Pumps can be constant or variable flow. Pump basics are covered in Pumping Basics, page 11. Both the chilled water and condenser pump must be sized for the design flowrates. Whenever the chiller operates, these pumps will operate. The result is that the design chilled water and condenser flow are being pumped any time the chiller plant is operating. Water-cooled chiller will require cooling towers. Cooling towers are covered in Cooling Tower Basics, page 15. Single chiller plants are the most straightforward to operate. Recognizing the need for chilled water is the first goal. This can be as simple as manually enabling the chiller. The process can be automated with a building automation system (BAS) which can recognize when mechanical cooling is required. All chillers must have chilled water (and condenser water, if appropriate) flow before they operate. The simplest method is to manually turn on the pumps prior to enabling the chiller. The chiller controller, in many cases, includes a signal to operate the chilled and condenser water pumps. In this case, the pump starters can be interlocked with the chiller control panel to start the pumps. Pumps should shut down when not required to save energy. The BAS can also start the pumps prior to enabling the chiller. enabled. The difference is subtle but important. the chiller will not start even though it has been enabled. would start as soon as you threw the switch. Variable flow systems add another degree of complexity but also provide significant pump work savings. Control sequences for variable flow systems are covered in other sections of this Guide. In addition to operating the pumps, it is necessary to prove that there is flow. Pressure differential or paddle type switches can be used and usually are connected directly to the chiller controller. Current sensing devices can also be used. Operating a chiller without flow can result in serious damage. It is recommended that the manufacturer’s installation instructions be followed carefully to provide proper operation and avoid warranty conflicts. Systems requiring a cooling tower will need to control it. Sequences for cooling towers are covered in detail in Cooling Tower Controls, page 18. Additional information on chiller plant controls can be found in product catalogs, as well as in installation and maintenance manuals. Consider a model 7-story office building in Minneapolis with 375,000 ft2. 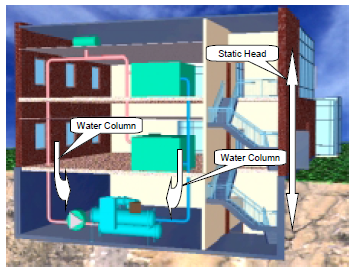 The air conditioning system is floor-by-floor VAV with reheat and a single chiller plant as shown in Figure 35. Reviewing the design performance does not indicate how well the system will operate annually. The annual kWh/yr usage tells a different story. Although pumps are much smaller than the chiller, they end up using almost two-thirds the energy that the chiller uses. This happens because the chilled water and condenser pumps must operate at plant design flow rates any time there is a requirement for chilled water. Although fans are not part of the chiller plant, it is important to notice that they too consume a significant amount of power over the course of a year. In this case, more energy is used operating the fans than the chiller. Annual energy analysis such as this can be performed for a specific project using McQuay's Energy Analyzer™. To provide some redundancy in the HVAC design, most designers will require two or more chillers. Multiple chillers also offer the opportunity to improve on overall system part load performance and reduce energy consumption. Parallel chiller plants are straightforward to design and are easily modified for variable primary flow. 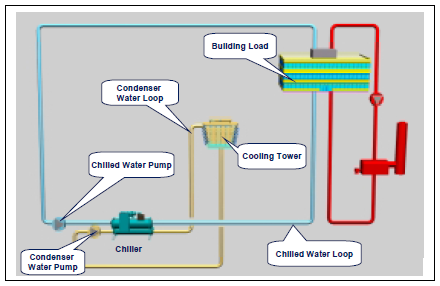 Figure 37 shows a parallel water-cooled chiller plant. Chilled water is circulated by the chilled water or primary pump through both chillers to the load and back to the chillers. The chilled water loop can be either constant flow or variable flow. Variable flow systems increase the complexity but offer significant pump work savings. They also resolve the issue about chiller sequencing that occurs with parallel chillers, constant flow. (See Variable Primary Flow Design, page 75.) Variable flow systems are covered in Primary/Secondary Systems and Variable Primary Flow Design. A condenser loop is required for water-cooled chillers. This includes a condenser pump, piping and a cooling tower or closed circuit cooler. The condenser loop operates whenever the chillers operate. For constant flow systems, the chilled water temperature range varies directly with the load. Depending on load diversity, the chiller design temperature range will be less than the temperature range seen at each load. In this case, the chiller temperature range is 8oF while the cooling coil range is 10oF (Refer to Piping Diversity, page 24). The overall result is increased chilled water pump and pipe capital cost plus higher annual pumping cost. ☺Tip: Parallel chillers experience the same percent load. chillers operating, both chillers will operate at 50% capacity. In most cases, the sum of the chiller capacities meets the design for the building or process. Additional capacity can be added, if required, by oversizing the chillers. It is common for parallel chillers to be the same size and type although this not a requirement. Water-cooled, air-cooled or evaporatively-cooled chillers can be used. Air and evaporatively-cooled chillers do not require a condenser loop including piping, cooling tower and pump. Pumps can be constant or variable flow. Pump basics are covered in Pumping Basics, page 11. The chilled water pump is sized for the design flowrate. 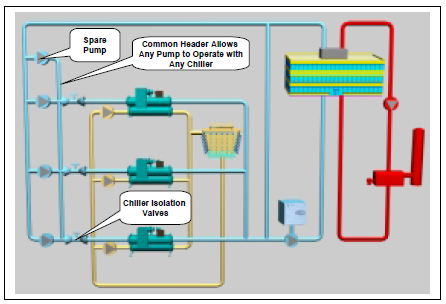 Figure 38 shows one main chilled water pump providing flow to both chillers. An alternative method is to have two smaller pumps serving dedicated chillers. 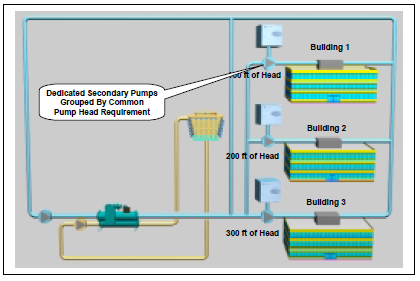 Figure 38 also shows dedicated condenser pumps and cooling towers for each chiller. The pumps and piping are sized for the design condenser flow for each chiller. Whenever the chiller operates, the condenser pump operates. Water-cooled chillers will require cooling towers. 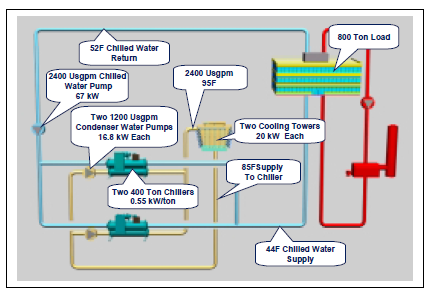 Figure 38 shows dedicated cooling towers for each chiller. A common cooling tower is also possible but not common for parallel chillers. Cooling towers are covered in Cooling Tower Basics, page 15. Parallel chiller plants create a unique situation when used in a constant flow system. Consider the system operating at 50%. From a chiller performance aspect, turning off one chiller and operating the other at full capacity is desirable. However, this will not happen. At 50% capacity, the return water will be 49oF. The chiller that is turned off will let the water pass through it unchanged. The operating chiller will only see a 50% load (49oF return water), and will cool the water down to the set point of 44oF. The two chilled water streams will then mix to 46.5oF supply temperature. If the system is operated in this manner, the warmer chilled water will cause the control valves to open (increase flow) to meet the space requirements. An iterative process will occur and the system may stabilize. The issue is whether the cooling coils can meet the local loads with the higher chilled water temperature. Depending on the actual design conditions, the building sensible load could be met but high chilled water temperature will make it difficult to meet the latent load. Since this scenario is likely to occur during intermediate weather, dehumidification may not be an issue. In areas where humidity is an issue, this arrangement can result in high humidity within the space. One solution is to operate both chillers all the time. This works and is a simple solution, however, it is not energy efficient and causes unnecessary equipment wear. Another possibility is to lower the operating chiller's set point to offset the mixed water temperature. This also works but has some difficulties. Lowering the chilled water setpoint requires the chiller to work harder, lowering its efficiency. In extreme conditions, it can cause chiller stability issues. Adding isolation valves to stop flow through a chiller when it is not operating is not recommended for a constant flow system. It is unlikely that the pump will be able to provide design flow if all the chilled water is directed through just one chiller. The pump will ride its curve and a loss of flow will occur. Without design flow, it is unlikely that all the individual loads will receive their required flows. In the event the pump could actually provide the flow through one chiller, the maximum allowable flow rate for the chiller may be exceeded resulting in serious damage to the chiller. The safe answer is to operate both chillers all the time chilled water is required, however, this is as expensive as operating a single chiller plant. Staging on the pumps and cooling towers is similar to that outlined for single chillers. Refer to Single Chiller Sequence of Operation, page 39. Consider the same model building used in the Single Chiller example. The parallel chiller plant is shown in Figure 37. The design load performance is identical to the single chiller plant. There are small changes in real applications when two chillers are used instead of one. For instance, pump and chiller selections are not likely to offer identical performance, other than being half the size. What is more interesting is the annual energy usage is the same for both single and parallel chillers. This occurs because both chillers were operated to provide 44oF supply chilled water at any plant load. With both chillers operating, all the pumps and towers had to operate as well. There was no opportunity to use only one chiller at light loads, shut down one tower and condenser pump and shift the single chiller further up its performance curve. This could be accomplished by switching to variable primary flow, which would allow a chiller to be isolated at light loads, as well as to reduce the chilled water pump size and to lower its operating cost. This is covered in detail in Variable Primary Flow Design, page 50. Series chillers are another method of operating more than one chiller in a plant. This design concept resolves the mixed flow issues found in parallel chiller designs. The chillers can be preferentially loaded as well, allowing the designer to optimize chiller performance. 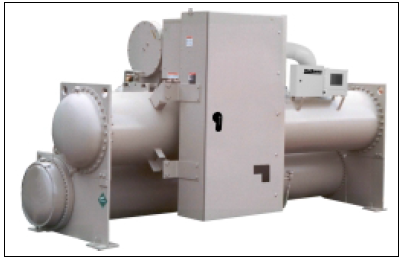 Series chiller systems are straightforward to design and operate. Figure 39 shows two chillers in series. All the system flow goes through both chillers. As a result, the water pressure drops through the evaporators are additive. The chilled water loop can be either constant or variable flow. Variable flow systems increase the complexity but offer significant pump savings. Variable flow systems are covered in Primary/Secondary Systems and Variable Primary Flow Design. A condenser loop is required for water cooled chillers. This includes a condenser pump, piping and a cooling tower or closed circuit cooler. The condenser loop operates whenever the chillers operate. If both chillers are the same and the condensers are piped in parallel, the lead chiller will accomplish about 45% of the system load and the lag chiller will accomplish about 55% of the system load. This occurs because the lead (downstream) chiller is supplying chiller water at the system set point (typically 44oF). The lag (upstream) chiller is supplying chilled water at approximately 48.5oF to the lead chiller. The reduced lift for the lag chiller allows it to provide more cooling capacity. For constant flow systems, the chilled water temperature range varies directly with the load. Depending on the load diversity, the chiller design temperature range will be less than the range seen at each load. In this case, the chiller range is 8oF while the cooling coil range is 10oF (Refer to Piping Diversity, page 24). The overall result is an increased chilled water pump and pipe capital cost plus higher annual pumping cost. A problem with series chillers is the high flow rate and the low temperature range through the chillers. The high flow rate can result in high water pressure drops. Since the chillers are in series, the pressure drops of the chillers must be added. If the typical 10oF system temperature difference is maintained, then single pass evaporators should be considered. This will lower the pressure drop to an acceptable level. Chillers selected for series applications require special consideration. Special care should be taken when using smaller chillers with limited shell arrangements such as small air or water-cooled chillers. The pressure drops are typically designed to be acceptable with the flow rates around 2.4 gpm/ton. When the flow is increased to 4.8 gpm/ton as in series applications, the pressure drop rises significantly. A 10 ft. pressure drop at 2.4 gpm/ton will be a 40 ft pressure drop at 4.8 gpm/ton. With larger chillers that offer flexible shell arrangements, single pass shells can be used to lower the pressure drop. Two single pass shells in series will be comparable to a typical two-pass shell in water pressure drop. pass to reduce the water pressure drops. The chillers will not see the same duty; the lead chiller has a different lift requirement than the lag chiller. The more difficult duty is the lead chiller. The selections must be done so that the chillers operating at the specific conditions will provide the required capacity. The actual chiller output and performance will most likely be different. Selecting both chillers to be the same machine and able to meet the requirements of the lead position allows the chillers to be interchangeable when the plant load is less than one chiller's capacity. There is some performance loss when the chiller is operated in the lag position because the chiller is not optimized for that specific lift. It is possible to select two different chillers, each optimized for their operating conditions. This arrangement will be slightly (about 2%) more efficient but the chillers will not be interchangeable. arrangements to outperform parallel chiller arrangements. Increasing the chilled water temperature range affects series chillers differently than parallel chillers. As the range is increased, series chillers will generally outperform parallel chiller arrangement. This occurs because the cascading effect of series chillers enhances the chillers' performance. Pumps can be constant or variable flow. Pump basics are covered in Pumping Basics, page 11. The chilled water pump is sized for the design flow rate. The chilled water design head will be impacted by having to add the chiller pressure drops together. 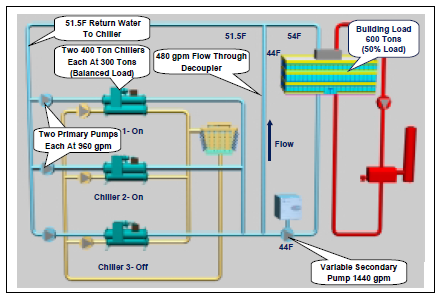 Figure 40 shows one main chilled water pump providing flow through both chillers. 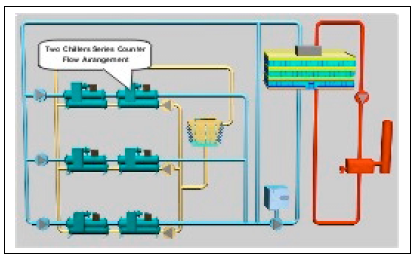 Figure 40 also shows dedicated condenser pumps and cooling towers for each chiller in a parallel arrangement. The pumps and piping are sized for the design condenser flow for each chiller. Whenever the chiller operates, the condenser pump operates. Water cooled chillers will require cooling towers. 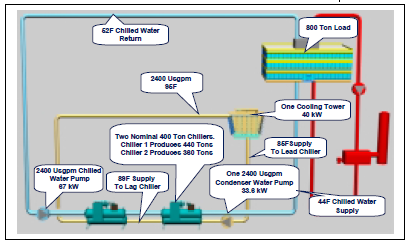 Figure 40 shows dedicated cooling towers for each chiller. A common cooling tower is also possible but not common for series chillers. Cooling towers are covered in Cooling Tower Basics, page 15. Set the upstream chiller chilled water setpoint to bring on the chiller once the downstream chiller is fully loaded. This will preferentially load the downstream chiller. The downstream chiller will operate at full load while the upstream chiller will ramp up as the chiller plant load goes from about 45% to 100%. If the downstream chiller is offline for any reason, the upstream chiller will not be able to assume its role unless the chilled water setpoint is changed, either manually or remotely. Move the upstream chiller sensor downstream of both chillers. This will preferentially load the upstream chiller. Once the upstream chiller cannot maintain the chilled water supply temperature, the downstream chiller will start and provide the balance of the load. Modern chiller controllers such as McQuay's Microtech™ controllers can allow two chillers to communicate. In this arrangement. Either chiller can be the first chiller on (assuming they were both selected to do the lead chiller duty). Once the first chiller is fully loaded, the second chiller will start and the load will be evenly balanced between the two chillers. This can result in about a 2% improvement in annual chiller energy usage. Where possible, this method is recommended. Staging on the pumps and cooling towers is similar to that outlined for single chillers. Refer to Single Chiller Sequence of Operation, page 39. Consider the same model building used in the single chiller example. The series chiller plant is shown in Figure 39. The design load performance is identical to the single or parallel chiller systems. In this case, it has been assumed that the sum of the chiller pressure drops for series chillers equals the pressure drops through single or parallel two-pass chillers. In most cases, the pressure drop will be higher for series systems. As before, air system fans are the dominant HVAC load when reviewing annual energy usage. Series chillers provide some savings over constant flow parallel and single chiller systems. In variable primary flow systems, parallel chillers would typically slightly outperform series chillers at ARI conditions. As the chilled water temperature range is increased, series chillers would again out perform parallel chillers. 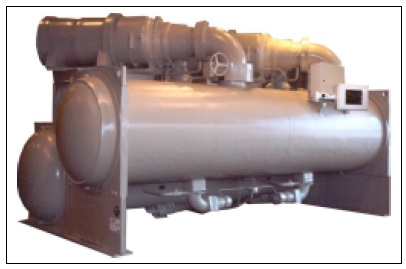 Series counterflow chillers are shown in Figure 41. 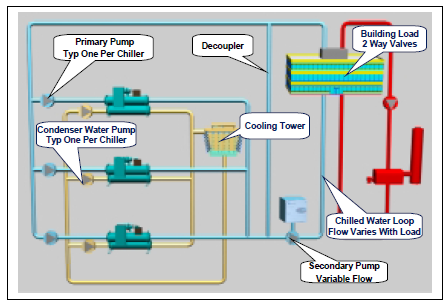 This arrangement differs from the series chillers system shown in Figure 39 in that the condenser flow passes through both chillers in series, counterflow to the chilled water. Series counterflow condenser water improves the chiller performance as explained in the Series counterflow chiller example. Series counter flow chillers can be 5 to 7% more efficient than a single chiller at design conditions and save up to 20% of chiller energy annually. However, the condenser pump is sized for the entire system flow (in this case 2400 US gpm) and this pump must operate whenever any chiller operates. The result is increased pump work annually. Series chillers with parallel towers may out perform series counterflow chillers depending on the chiller savings versus pump losses. Where series counterflow chillers can be advantageous is in large primary/secondary chiller plant systems. 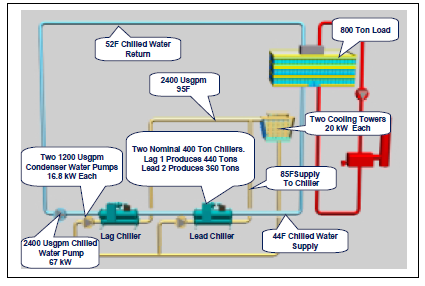 The lower figure shows series chillers with the condensers piped in series counterflow to the chilled water. The arrangement enhances the chiller performance by "cascading" the chillers. The above figure shows the lift requirements for series chillers with parallel towers. Chiller 1 has a smaller lift because it sees the return chilled water. Chiller 2 sees a higher lift because it cools the water to 42oF. Since both chillers have the same discharge pressure requirement (dictated by using 85oF-95oF condenser water), the chiller lifts are different. The above figure shows the lift requirements for series counterflow chillers. Now chiller- 2 sees a lower lift because the discharge pressure has been reduced as a result of the lower condenser water temperatures. The chiller lifts are almost balanced which will always provide the best refrigeration performance. During periods when the chiller plant load is less than 45% (about the limit for one chiller) the VFD chiller can be used and take advantage of any condenser relief available. Considering this is a part load situation, condenser relief should be significant. When two chillers are required, the VFD chiller can use the VFD to optimize its performance while being used in the lower lift application. Both chillers do not need to have VFDs. Either chiller will work in either application (lead or lag) without a VFD. Consider the same model building used in the single chiller example. 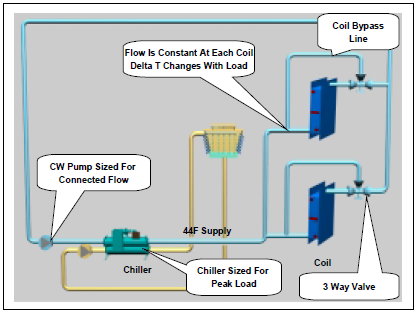 The series counterflow chiller system is shown in Figure 41. The series counterflow arrangement has improved the chiller performance as described in the sidebar. This has resulted in an overall design condition performance improvement. As expected, the annual chiller work went down because of the enhanced chiller performance. On the other hand, the large condenser pump (sized for the design condenser flow) which must operate whenever there is a need for chilled water, has increased the annual pump work. Whether series counterflow will save energy on an annual basis will depend on the pump penalty vs. the chiller savings. The previous section covered several common chiller system designs based on constant flow systems. Each system has strengths and weaknesses in terms of design. A key operating parameter is the annual energy usage. Table 5 shows the design condition power usage of the chiller systems covered in the last section. As can be seen, all the systems have the same full load performance. The series counterflow chillers provide better performance than the other systems because of the cascading effect. At nominal ARI conditions, these chillers would perform the same as the other chillers. Table 6 shows the annual energy usage of the various chiller systems. This tells quite a different story. The single and parallel chiller plants perform the same because the parallel system operates the two chillers at all load points. There is no easy way to shut down a chiller in a parallel, constant flow arrangement. The series chillers outperformed the parallel chillers. The water pressure drops, however, were held constant. If the water pressure drops through the series chillers had been increased as is typically the case, then there would have been little or no difference. □ Design performance is a poor indicator of annual performance. There is no way to tell which system will perform the best by reviewing the design condition performance. □ Sequence of operation is a major factor. How the system operates will vastly affect the savings. □ In constant flow systems, pumps are a major component. Although the pump motors are only 25% the size of the chiller, they use more than 60% of the power that the chiller uses. □ Increasing the chilled water temperature range will improve the performance of the series chiller systems relative to other chiller systems. The chillers will operate more efficiently and the pressure drop penalty will be less of an issue. □ Variable flow systems can save significant pump energy. They will be discussed in future sections. For large chillers or where more than two chillers are anticipated, primary/secondary (also called decoupled) piping systems are often used. To reduce installation and operating costs, it is desirable to apply diversity to system flow. With diversity applied to flow, the pumps and piping will be smaller. To accomplish this, two-way control valves are used at the loads. At the same time it is desirable to provide constant flow through the chillers to maintain chiller stability. The solution is primary/secondary piping. 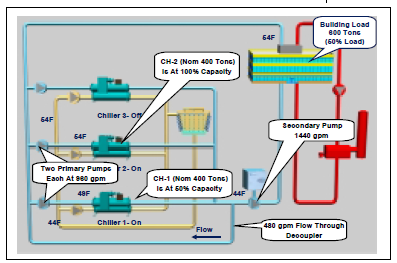 Figure 42 shows a 1200-ton primary secondary system with three chillers. The system is operating at 50% or 600 tons. The 600- ton load requires 1440 gpm. Two chillers are operating along with their 960 gpm primary pumps. The additional flow from the two primary pumps bypasses the building through the decoupler. The bypassed water mixes with the return water from the building and is returned to the chillers. Both chillers operate at the same percent load (300 tons). loading chillers is possible, see Decoupler. 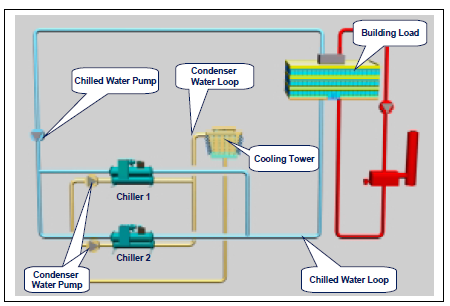 Figure 43 shows a typical primary secondary chiller plant with four chillers. They can have any number of chillers. Any size and type of chiller can be used. Different capacity chillers are acceptable and can be advantageous depending on the load profile. The only requirement is all chillers must operate on the same chilled water temperature range. Unless specially configured (See Decoupler, page 53) all operating chillers will have the same percent load. Primary pumps provide constant flow through the chillers. They can be dedicated to each chiller as shown or there can be a primary pumping plant providing constant flow to each chiller. 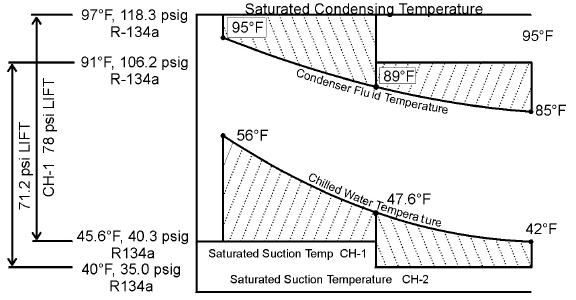 Primary pumps can utilize a common header (See Figure 44) to allow a particular pump to serve several chillers. The advantage is should a pump fail, the chiller can still be used by activating one of the other pumps. A spare pump can also be built into the arrangement. The disadvantage to headered primary pumps is complexity and cost. If the chillers have different flow requirements (meaning they are different sizes) then intermixing pumps becomes even more complicated. It can be done using VFDs on the pumps. The BAS can be preprogrammed with the appropriate pump speed required to deliver the correct flow to each chiller. This allows each chiller to receive its correct flow rate. The flow for each chiller is based on the design flow required by the chiller. The flow is only provided when the chiller is operating. An automatic isolating valve is required for each chiller to stop short-circuiting when the chiller and pump are off. Primary pumps need only provide enough head to move chilled water through the chiller and the piping pressure drops between the chiller and the secondary pumps. Heads in the range of 25 to 75 ft are common. If the chillers are water cooled, each chiller will have a condenser pump and cooling tower or other form of heat rejection device. Like the primary pumps, the condenser pumps can be dedicated to each chiller as shown or a condenser water pump plant can provide condenser flow. The flow rate to each chiller is typically constant and based on the design flow rate for the chiller. Where the head pressure drop is particularly high, variable flow condenser pumps may offer additional savings and are becoming more common in chiller plant design. Cooling towers can be grouped or individual. Individual towers allow the tower to be sized specifically for the chillers needs, which can be important in hybrid chiller plants. Refer to Cooling Tower Basics, page 15 for more details. Secondary pumps are variable flow and sized to provide flow throughout the chilled water plant. In a sense, they handle all the pressure drops "outside the mechanical room". Refer to Variable Flow Pumps, page 13 on how to vary the flow through pumps. Most secondary pump arrangements include multiple pumps and often a spare pump. Figure 46 shows dedicated pumps for various loops. Multiple loops can serve areas with different operating schedules or widely different fluid pressure drops (such as a building on the far side of a campus). The individual loops can be scheduled off when not required. A good system design should always group loads with common pressure drop and scheduling requirements to reduce pumping work. Referring to Figure 45 it would appear that the primary and secondary pumps are in series. This is not the case however, because of the decoupler. The decoupler allows the pumps to operate at different flow rates. This is necessary because the primary pumps are fixed speed and the secondary pumps are variable speed. Only on special occasions will the primary pump flow and the secondary flow be equal. An example would be when the cooling load (and secondary flow) can be met by a fully loaded chiller. 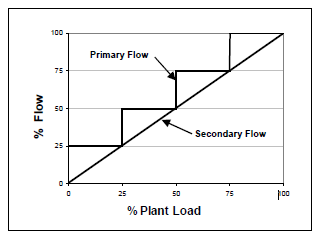 Figure 47 shows primary flow vs. secondary flow. Secondary flow is based on the load in the building. Specifically, the secondary flow rate is produced to maintain the necessary system pressure differential. Primary flow must always meet or exceed the secondary flow. Any excess primary water flows through the decoupler to the return side and back to the chillers. Any time the primary flow is less than the secondary flow, warm return water will flow “backwards” through the decoupler and mix the primary flow going out to the building. Decoupler Sizing Decouplers should be sized for the flow rate of the largest primary pump. This may be more than the design flow rate of the largest chiller if overpumping is being considered. The pressure drop should not exceed 1.5 ft. As the pressure drop through the decoupler increases, it tends to make the primary and secondary pumps behave like they are in series. To avoid thermal contamination, the decoupler should be at least three pipe diameters in length. Longer decouplers tend to increase the pressure drop. When the secondary return flows straight through in the tee to the primary return, there should be at least 10 pipe diameters to the first chiller. This is to help avoid the possibility of having stratification in the primary return line, which can lead to unmixed water to the first chiller. This can lead to chiller cycling. ☺Tip: In situations where a new chiller is added to an older existing chiller plant, relocating the decoupler can take full advantage of the new chiller's part load performance. Older chiller may operate at 1 kW/ton or more at full load, worse at part load. Relocating the decoupler allows the older chillers to be base loaded (their best operating point) while the new chiller is operated at part load. Consider either a VFD or dual compressor chiller for additional savings. Decoupler Location The location of the decoupler line will change how the chillers are loaded. Figure 43 shows the typical layout with the decoupler between the chillers and the load. In this situation, each chiller sees the same return water temperature even at part load conditions. Figure 49 shows the decoupler line in a different location. Locating the chillers between the secondary loop and the decoupler line causes the return water temperature to each chiller to vary. This is often referred to as "backloading" or “preferentially” loading the chillers. Chiller 2 in Figure 49 will see close to the secondary loop return water temperature. Chiller 1 will see a mixture of supply water and return water. As a result Chiller 2 is more heavily loaded than Chiller 1. Relocating the decoupler can make sense if one or more of the chillers is a dual compressor model. The dual compressor chiller has very good part load performance. Single compressor chillers typically work best when fully loaded. By locating the dual compressor chiller close to the decoupler line and the single compressor chiller furthest away, the strengths of each chiller can be maximized. Another application for backloading chillers is where one of the chillers is a heat recovery type or a McQuay Templifier™ is connected to the condenser loop. In this case, providing additional load to that chiller provides a heat source for the energy recovery process. Decouplers should be sized for the maximum design chilled water flow through the largest chiller. Their length should be as short as possible to minimize pressure drop. 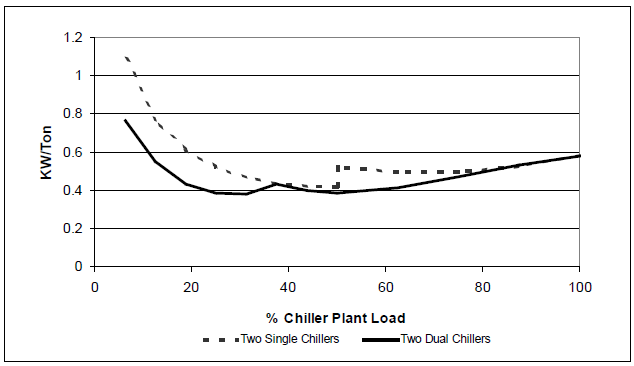 The table below shows the chiller plant performance for Figure 42 and Figure 49. Assume for Figure 42 the two chillers are standard 400-ton single compressor type. In Figure 49, Chiller 1 is a standard chiller while Chiller 2 is a dual compressor chiller with outstanding part load efficiency. By base loading the single compressor chiller and taking advantage of the dual chiller's part load performance, the power input can be cut by up to 10 percent. ☺Tip: There are many instances where facilities designed with different chilled water temperature ranges are required to operate from a common chilled water plant. This is a common occurrence for large university and health care campuses. Tertiary piping can be used to connect buildings with different design temperature ranges and supply water temperatures to a common plant. This arrangement can be variable flow by making the tertiary pump variable. A key advantage of this arrangement is the tertiary loop does not have to have the same temperature range as the main loop. The design chilled water temperature in the tertiary loop must be warmer than the main supply chilled water temperature. If they are the same temperature, the two-way valve will open and bleed supply water into the return line leading to low delta T syndrome (See Low Delta T Syndrome Causes and Solutions, page 82). The two-way valve should control to maintain the tertiary loop supply temperature (approximately 2oF warmer than the main loop) and should close when the tertiary loop is not in operation to avoid unnecessary crossflow. Primary/secondary piping allows easy expansion both in the chiller plant (primary loop) and the building (secondary loop). 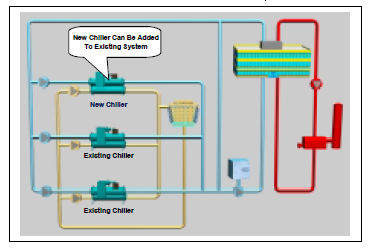 To expand the chiller plant capacity, another chiller can be added to the loop as shown in Figure 51. By strategically locating the decoupler and the new chiller (see Figure 49), it is possible to apply a greater load on the new chiller. This can be advantageous if the new chiller is more efficient than the rest of the plant. If the building load is increased, a new loop can be added. The pump for the new loop can be sized to meet the new loop’s pressure drop requirements. One advantage of primary/secondary systems is varying the chiller sizes. As long as the supply water temperature and the design delta T are the same, the chillers can have different capacities. ☺Tip: Healthcare facilities using constant volume with reheat systems have a significant base load. The only variable load is the ventilation load. This makes health care facilities an excellent choice for varying chiller sizes. Varying the chiller sizes allows chillers to be selected so the chiller plant is at maximum performance when the run-hours are highest. For example, consider a chiller plant where two chillers can be used. The bulk of the run-hours will be at 50% to 70% of design capacity. This will require the two equally sized chillers to operate between 50% and 70% of their design capacity. By varying the chiller sizes to one at 700 tons and one at 300 tons, the system load can be met with one chiller for the bulk of the operating time. The savings come from operating one chiller at near full load conditions over two chillers at part load conditions and from avoiding operating additional ancillary devices such as primary and condenser pumps. Variable Chiller Size Example Consider a 320,000-square foot hospital in Minneapolis. The design load is 1000 tons. The primary system is a two chiller primary/secondary system. The graph below compares two 500-ton chillers, a 700-ton dual compressor chiller with a 300-ton chiller and a 700-ton VFD chiller with a 300-ton chiller. The two 500-ton chillers provide a benchmark. Since the hospital has a load profile with many hours between 50 and 70% of design capacity, the next two options outperform the benchmark. During these hours, only one chiller is required to meet the load avoiding the need for two primary and condenser pumps. The result is more efficient use of the chiller and reduced pump work. To take full advantage of the situation, the larger chillers are either dual compressor type or VFD type, both of which have excellent part load performance. Even if one of the benchmark chillers were switched to a VFD chiller, the two options would still have had better performance. During the spring and fall seasons, the operator has the option of using the chiller whose size best fits the expected load. For instance, on a light load day, the smaller chiller can be used. The chiller will be more fully loaded than the larger chiller offering a performance improvement for the chiller. In addition, the smaller primary condenser pump and tower fan will be used offering ancillary equipment savings. Very large chilled water plants follow the same basic design considerations discussed so far. 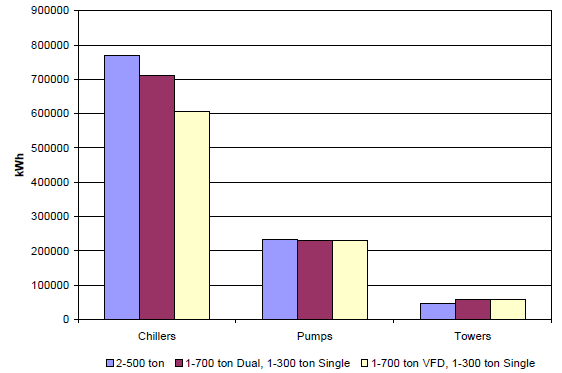 The scale of large chiller plants, however, creates some trends that should be addressed. Large plants tend to use large (18oF or greater) chilled water ranges to reduce pump and piping sizes and pump work. This in turn requires lower chilled water temperatures to offset the effect on the cooling coils (see Water Temperatures and Ranges, page 25). 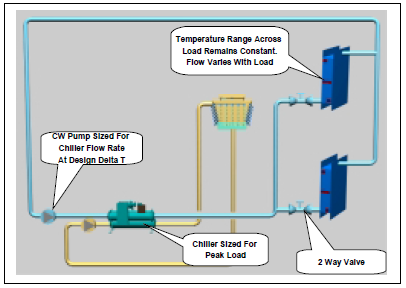 Figure 52 shows series counterflow chillers in a primary /secondary system. The series counterflow arrangement provides an efficient means to produce 40oF supply water with and 18oF temperature range. The series counterflow arrangement can provide about 5% better annual performance than single large chillers when using large temperature ranges. The primary/secondary arrangement provides variable flow in the secondary loop to reduce pipe and pump size and save pump work. Whenever a chiller is on line, there will need to be condenser flow and a means to cool it. With dedicated pumps and towers to each chiller, this is straightforward. They can be operated by either the chiller control panel, assuming it has outputs, or by the BAS. The chiller control panel may offer better performance since it has intimate understanding of the needs of the chiller. Using the BAS to operate the equipment makes the operation easily visible to the control system and to the operator. (For example, without an additional flow sensor, it may not be obvious to the BAS that the condenser pump is operating.) Using either Open Protocol™ or Protocol Selectablity™ allows the chiller to operate the equipment while providing easy visibility for the BAS and operator. The information is passed digitally from the chiller controller to the BAS. When the condenser pumps are shared in a common header the sequence becomes more complex. Automatic isolation valves will be required. If the pumps are all the same size, the BAS must open the valve and start a condenser pump. The pump sequence is usually based on pump run-hours. When the chillers have different condenser flow requirements, the system becomes very complex. Flow meters may be required. When a common cooling tower plant is used, a sequence to determine the optimum condenser water temperature is required. Special care should be taken when an absorption chiller is used in a hybrid plant. Generally an absorption chiller has different condenser water requirements than a centrifugal chiller. Primary pumps will have similar issues as condenser pumps. Dedicated pumps are straightforward. Common pumps in a headered arrangement are more complex. When overpumping is considered as a solution to low delta T syndrome or to take advantage on additional chiller capacity during low lift situations, the sequence can be very complex. Secondary pump operation in general is covered in Variable Flow Pumps, page 13. A critical requirement of primary /secondary systems is that the primary flow always be equal to or exceed the secondary flow. Theoretically this should happen because the chilled water temperature range is constant and the chilled water flow is proportional to the cooling load. 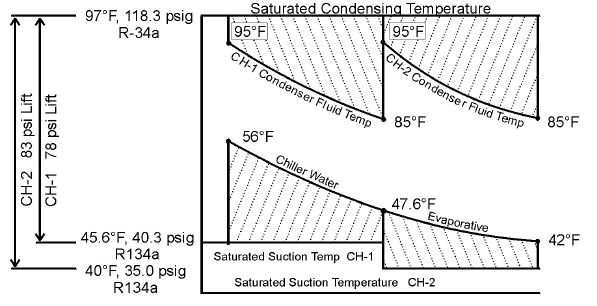 ☺Tip: It is absolutely necessary for the primary chilled water flow to equal or exceed the secondary flow (See Low Delta T Example, page 83). The primary/secondary control system must maintain this flow relationship above all. Assuming this happens, chillers could be staged on and off based on their load. However, this is not necessarily a good control scheme. First, Low Delta T syndrome can cause a disconnect so the chilled water flow is not proportional to load. (See Low Delta T Example, page 80). Just using chiller load will not recognize when this situation occurs. A second issue is the chiller power draw is not an exact indicator of the actual cooling effect. For instance, if there is condenser water relief, the chiller will produce the required cooling effect with less kilowatts. It is even possible for the chiller to produce more than the design cooling capacity with the same kilowatts if there is some form of condenser relief. Monitoring the chiller power load can be advantageous and can provide some guidance in chiller staging along with other data inputs discussed below. Power monitoring can be accomplished by using communication gateways such as Open Protocol™ or Protocol Selectablity or with power meters. To make sure the primary flow meets or exceeds the secondary flow, the BAS must also monitor chilled water flows. One method is measuring the direction of flow through the decoupler. A flow meter in the decoupler can be difficult due to the short pipe length and low flowrates. It is important that if a flow meter is used, that it actually works and provides meaningful information. Another method is to measure the chilled water temperature in the decoupler. A single temperature sensor in the decoupler in principle should work. For instance if the temperature is near the supply water temperature setpoint, then flow must be going from the supply to the return (which is what is required). However, if the temperature rises to close to the return water temperature, then the flow must have reversed (which is not desirable). In practice, a single sensor can lead to false readings for several reasons. For example, low delta T syndrome can make the actual chilled water temperature range very small so the BAS cannot tell which way the water is flowing. A more reliable method is to use temperature sensors in the supply and return piping on both sides of the decoupler. This arrangement allows the BAS to monitor the actual chilled water temperature range at the decoupler. With four sensors, the BAS can monitor that the chilled water temperature does not rise as it passes the decoupler, that the return water temperature may rise as it passes the decoupler and that the decoupler water temperature is close to the supply chilled water temperature. Once the situation occurs where there is reverse flow in the decoupler, another chiller and primary pump must be added to keep the chilled water plant operating properly. Using temperature sensors may not provide very much warning. Another method for staging chillers is to use a flow meter in the chilled water supply line down stream of the decoupler. Using the required flow and the flowrates for each of the primary pumps (These are fixed flowrates), the BAS can monitor that there is enough primary flow for the required secondary flow. This method is very reliable. It can also provide some warning that another chiller/primary pump is going to be required. Normal schedules have the next chiller start when the current chiller has been operating at 90% capacity for 30 minutes. The actual load and time period vary from project to project. Many operators do not want a chiller to automatically start but prefer that the BAS indicate a chiller is required. If the operator acknowledges the start request, the BAS can then enable another chiller. High part load performance chillers such as a VFD or dual compressor chiller may create an opportunity to operate the chiller plant in a different but more efficient manner. These chillers operate more efficiently at part load then at full load. Refer to Dual Compressor and VFD Chillers, page 31. The previous section provides the basics to get a primary/secondary system to operate satisfactorily. Leading edge control systems are aimed at improving overall system efficiency. To accomplish this, algorithms are developed that model the building load profile and monitor the weather. Threedimensional chiller models are also used along with matrices for the power consumption of individual ancillary components. The program then simulates the building load and monitors the weather conditions. It evaluates which combination of equipment will use the least power to accomplish the load. In large systems, this additional effort has been shown to pay for itself.